I am so excited to finally have liquid soap up here, and in my bathroom at home. 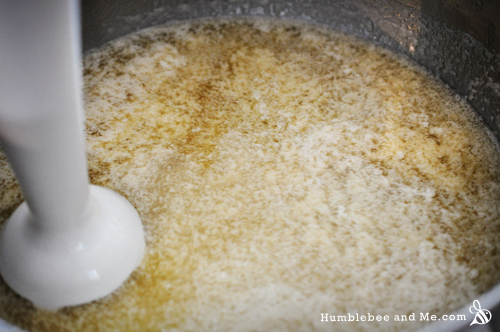 Like many of you I’ve read about making my own liquid soap and though “Wow. That is a ridiculously involved process, and sounds way harder than bar soap… and maybe it’s just not worth the effort.” And who could blame us? The processes I found required hours of work and supervision, careful calculations that are different from bar soap, pH testing, neutralizing the final product with acid, and a lot of mess with a potato masher. Not this method. Nope. It’s not too good to be true, either—I promise. 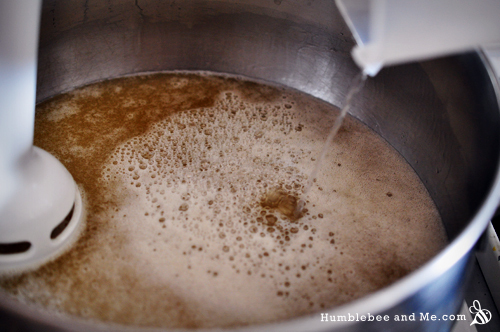 Let’s learn how to make liquid soap the easy way! The final liquid soap paste. The primary difference between liquid soap and bar soap is the type of lye you use to convert the oils into soap. Bar soap uses sodium hydroxide. Liquid soap uses potassium hydroxide. After that, everything seems to change—or so I thought, from my reading. But then I met Colleen, and we had a DIY date. She has more soaping experience, and I seem to be more cosmetics inclined. She’d made lots of liquid soap, and promised to walk me through it after I confessed I’d never tried it thanks to how crazy complicated it sounded. She promised me my sources were over-complicating things, and she was right. And, best of all, we managed to simplify things even more. Potassium hydroxide flakes. Cool, eh? We started off by using almost all the same ingredients as my all-in-one bar. The only ingredient that was ditched was the tallow (no need for a hardening fat here) and the clay (to start with, at least). And we calculated it the same way as you’d run the bar soap through SoapCalc, only selecting KOH instead of NaOH, complete with a 5% superfat. So far, so good. Up next was putting the oils in my big soaping pot and melting them over medium heat. While that happened, we measured out the water and added the carefully weighed out KOH flakes. KOH dissolves much more easily than NaOH, so the jug only needed some swirling the get it to dissolve. KOH also reacts much more enthusiastically with the water, making boiling water noises and letting off steam quite quickly. As usual, don’t touch it/get it on your skin, and if you do, rinse it off. Also, don’t inhale the gasses that come out of the jug, and do this in a well ventilated area. 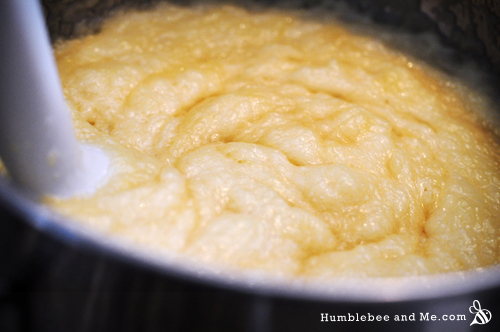 The mixture will look like curdled milk at first, with little wispy clumps of paler stuff floating in the oil. No worries, you’re right on track. Get your immersion blender and start blending. Be careful not to splatter the mixture. We started with a small batch (made from 500g of oils), and that didn’t quite submerge the blender head, so we tilted the pot a bit to create a “deep end” from which to blend. And blend. And blend. And stir. And blend some more. It’s going to take a while (20–30 minutes is not abnormal). You will eventually get to something that sort of looks like creamy pudding or applesauce—ours was never quite pudding-like, just applesaucey. At this point it’s best to swap the blender for a sturdy spatula (I like spatulas like these ones, where the head can’t pop off the handle so you don’t have to go chasing after it if it pops off, which definitely happens when stirring and mashing something this thick), as the mixture will start to thicken, and you’ll end up with unevenly cooked soap paste packed into the blade tent on your immersion blender. You should switch to a spatula at this point. And now we stir! We are basically hot-processing the liquid soap paste and speeding things along, even as compared to the crock pot method. 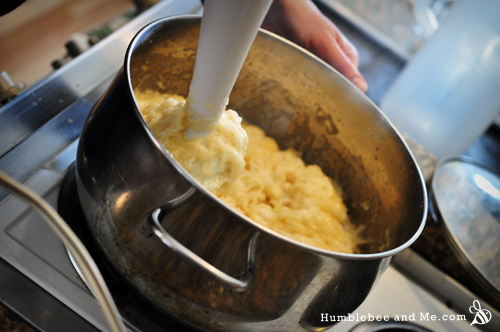 As you stir the mixture will thicken and start to pull away from the pot, going from something that’s like runny mashed potatoes to something like very thick mashed potatoes. Keep stirring. You’ll eventually get to a sort of semi-translucent Vaseline-like point (it took us about 15 minutes to get there from initial trace). That’s where you’re done(ish)! Sweet! So, now you’ve got a paste. Before you can use it, you’ll need to dilute it. However, you don’t want to dilute it all right away, because once you add the water the clock is on for the life of the soap. Instead, pack most of it away. I filled two 250mL/1 cup wide-mouthed mason jars with soap paste, labelled them, and put them away with the rest of my soap bars. I saved the rest to dilute for immediate use. Traditional dilution generally involves a potato masher and a lot of frustration. I am boycotting that method. For my method, you will need lots of time, but it’s almost entirely downtime. Basically, you soak the paste in some water in a sealed leftovers container for a day or so, mashing a bit as you go (a fork works brilliantly here). I find it’s best to think of it as “softening” rather than “diluting”. You basically just leave the paste in a sealed container with some water, and it absorbs it. As it does this, the soap becomes softer. And that’s it—liquid soap! Add essential oils as desired (major bonus—you need FAR less than you need for cold processed, and because you’re adding them at room temperature they retain their strength). At this point you can leave your liquid soap somewhere cool and dark to let any particulates settle out, but I can’t really be fussed with that, and I use mine straight away. Is my soap crystal clear? Nope. But did I make liquid soap that is totally usable in less than a day? Yup! Cool, eh? 2019 update: I’m afraid I can’t offer much in the way of detailed troubleshooting information for this project as I haven’t made liquid soap using KOH in well over 3 years and my memory of the process is limited to my notes, which you’re reading here. Sorry! Use SoapCalc to get your final measurements of KOH and H2O, based on your batch size (I’d recommend not going smaller than 500g of oils as that starts to get tricky to blend, especially if your pot is quite large). Be sure to check the “90% KOH” box to prevent too much of a superfat—most KOH is only 90% pure, so checking that box accounts for that in the calculations. 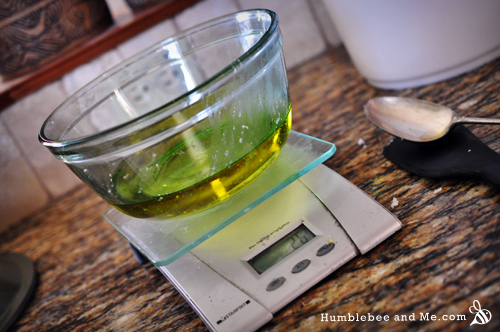 Melt the oils together in a large (non-aluminum) heavy bottomed pot over medium heat. Weigh out the water into a large, dishwasher safe jug. 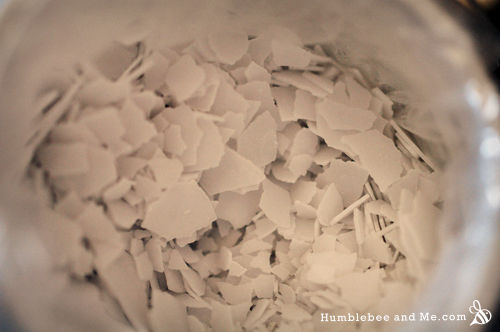 Weigh out the KOH carefully into a small container and add it to the water, swirling it gently to dissolve the flakes. It will bubble and steam—avoid inhaling the emissions. Once the oils have melted, turn the heat down to low (2/10 or so) and add the lye water. Get out your immersion blender and start blending to reach trace—this will take quite some time. 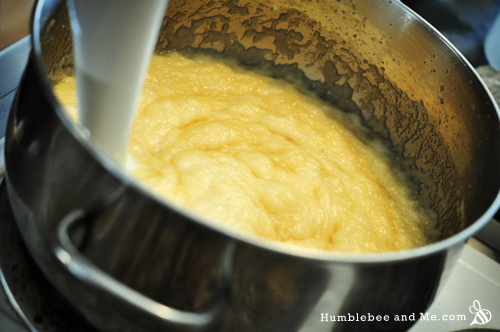 After 20–30 minutes of stirring and blending, you will eventually end up with something the texture of pudding or applesauce. At this point, switch out the emulsion blender for a flexible, sturdy silicone spatula—we have achieved trace and are now cooking the paste. Stir as the mixture continues to cook. There are a lot of cooking stages that you can apparently witness, but all I saw using this hot processed method was runny mashed potatoes to thick mashed potatoes to translucent vaseline like paste. Once you reach the translucent paste stage you’re done—do a zap test to confirm (aka touch a small amount of the past [let it cool first!] to your tongue—it shouldn’t “zap”). 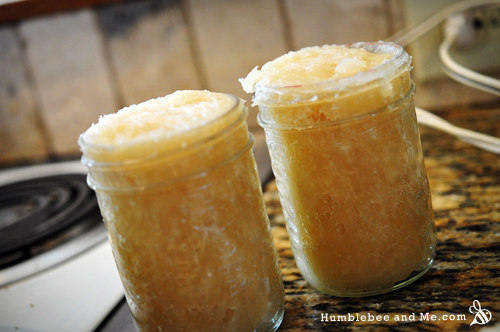 You’ll want to store most of the paste to dilute as needed—mason jars are great for that. To dilute, start with a 1:0.6 ratio of paste to water by weight (eg. 100g soap paste, 60g water—you’ll always want to be using more soap paste than water unless you like your liquid soap very firmly on the liquid side of things). I used tap water. Place the paste and water (just-boiled is best) together in a leftovers container with a sealing lid. Mash it a wee bit (use a fork rather than a spatula to avoid splurting), and then seal it and leave it. Overnight is a good starting point. 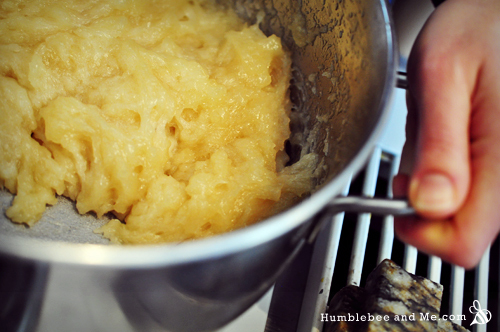 The next morning, mash it about a bit and try to break up the blobs of soap paste. Re-heat the mixture a bit, re-seal, and let it sit some more. Continue this until you have a homogenous mixture. Yes, it takes a while, but at least it’s almost entirely downtime. Now you can add your essential oils—a major bonus of liquid soap is that you’ll need far less essential oil to get the scent you want because they don’t have to live through saponification or aging. Score! Transfer to a pump-top container (these blue glass ones are super pretty, while the Human Gear GoToobs are fantastic for travel) and voila, soap! If you like your soap thicker than it ended up being, you can sprinkle in a bit of guar gum or xantham gum to thicken it up to your preference, and then adjust your water amounts next time. Whoops. You can also just add some more soap paste and let that dissolve, but I find that second soap paste addition takes quite a lot longer to dissolve than the first one—days instead of hours. Great job! Do you have pictures of the final mixture? Marie, do you superfat this recipe? Hi, I am new to soap making in general. I followed your instructions for a 5% superfat. Do I need to worry about ph or neutralizing? My recipe for my soap paste is 25%: shea butter, mango butter, 92 degree coconut oil, and grape seed oil. I used soap calc for my recipe via your instructions. I am using this for a shampoo. I have low porosity hair and am wondering if I still need a acid rinse or, a two in one (conditioner acid rinse). Also wondering if my hair will need an adjustment period? My husband and I share an e-mail so the icon may be of his face, don’t be alarmed. Because this has a superfat you do not have to worry about neutralizing; that is to counteract NOT superfatting 🙂 You will definitely still need an acidic rinse; that is for PH correction and has nothing to do with the porosity of your hair. Your hair likely will need an adjustment period; check out some of the posts here to learn more. Obviously your journey will not be identical to mine, but seeing what mine was like will probably help! Marie,Im thinking of going a bit more natural in this new year. Would it be possible to make this straight into a big batch of liquid soap rather then a paste into liquid soap? Could I just add more water? Hello Marie, your post has been an immense help but I had a total disaster trying my first experiment in soap making. I used olive & coconut oil at 500ml and castor oil at 250 ml. Then KOH at 9oz and water to dilute at 27oz. Then the disaster began. First, after adding the KOH to the oil, it turned creamy but remained watery. I let it heat for a bit then stick blended it but no sign of a trace. I added a few lumps of cocoa butter still nothing. Added more lye and nothing still. I left it over night and checked this morning and it was a separation of oil on top and sediments below. I really have no idea what I did wrong cos I followed an exact measurement I found online. I live in Nigeria and got the KOH from a local market where it is referred to as caustic potash. Did I get the wrong lye? You also don’t mention anything about calculating how much KOH you’d need… you just say you used a measurement you found online… and then you added “more” with no measurement. You also don’t know if you’re using KOH, and if you are, how pure it is. Your KOH should look like flat, white flakes, but even if it does it is likely still not 100% pure as most KOH is around 90% pure. So, basically… it sounds like you did most things wrong 🙁 Soap making isn’t like cooking; you can’t just add a bit of this or that and adjust on the fly. You have to use precise WEIGHT measurement and follow precise procedure to get good results. It’s more like baking in that regard. Sorry to be the bearer of bad news! I hope your next attempt is more successful and that this doesn’t put you off soap making completely. I just tried making liquid soap in the crock pot and the paste doesn’t seem to be turning clear even after overnight cooking. Can I just dilute it and if it’s not all the way clear that’s fine? Did you ask this exact question on YouTube as well? Or am I going crazy? What are the odds? I am making liquid soap as we speech. Will try your method! Thanks for another great post!! Have a wonderful Easter!! Ha! Enjoy your liquid soaping 🙂 Happy Easter! I love liquid soap. Next time you should try glycerin liquid soap, no cooking needed. You use glycerin instead of water to dissolve your KOH. It’s super easy! I was hoping the glycerin would help with neutralizing the KOH and not needing Borax or Citric Acid, but it seems probably not. I’m going to try castile (all olive oil) again, but this time with glycerin. Oooh, neat! Methinks I need to go buy a bigger jug of glycerin so I can try this. I’ve used the glycerin method a number of times. At 160 degrees my paste formed up very fast, I didn’t even have to stick blend one of the times. My cook time is about 1.5 hours (I’ve made it 4 times). The problem I have had is getting the glycerin to dissolve the the KOH completely. It does cut down on the time but it does increase the expense. I’ve returned to the water method – it seems somehow easier to control and most of the cook time is downtime anyway. I just plan it around chores and around the house things and before you know it, it’s done. As an experiment I’d recommend everyone try it. I had to heat up the glycerin to get the KOH to dissolve. It worked pretty well and went fast. I was wondering the same thing! (Didn’t see your comment before I posted mine.) Also, what exactly happens to make the soap bad – does it just stop lathering up, does it grow germs, what? Also wondering how long liquid soap will stay ‘good’. I actually read somewhere that the PH levels of liquid soap will not allow bacteria to grow, and so a preservative is not necessary. Do you agree? I don’t thinks so, every time there is water involved there is a big chance to get bacteria and mole growths. That’s why I would like to know how long DIY liquid soap can stay well. Cool, Marie! This is a method I’ve been thinking about doing for a long time, because it seemed to me it could work ‘in theory’ (basically just hot processing it). So glad someone went ahead and did it! Thank you! More info on the comments section, too. Hi Mia! It sounds like great minds think alike 😉 Let me know when you try it! I really wouldn’t recommend using an immersion blender to speed up the dilution process. I mean, you could put it in a blender if you really wanted to, but you’ll get a great big lathery mess, and honestly, the dilution process is pretty fast when you let it happen overnight. I heard back from Colleen (who I made the soap with) and she says hers starts to smell of rancid oil when it’s gone bad. An antioxidant would likely help with that, but apparently it takes ages to get to that point. The pH thing definitely makes sense for bacterial spoilage—I should get some more precise pH testing strips and do some experiments! Absolutely. Liquid soap will not go bad. I have tons of liquid soap and it has not gone bad. Introducing botanicals will introduce a risk of it going bad. I do not superfat my liquid soap. I dilute my soap all at once, let it cook in a crock so it won’t overflow on me. I let it sit for 2 weeks and decant so it is crystal clear. It is also clear because I do not superfat. If you have concerns, do some research. Concerns are good. Hi Elizabeth, I’d also love to see your recipes – especially the liquid laundry soap! I’ve tried soap nuts, and some of the powders etc but none are ‘cleansing’ enough for our lifestyle :). Like to try one made with liquid soap. And what difference do you notice between superfatting and no-superfat? By “crystal clear”, do you mean clear and colorless? I’m interested in making clear, colorless soap, but in a lot of these recipes it seems that the paste is yellowish and the final product is opaque and yellow, too. Even in the few instances where it seems clear (i.e. translucent), it has a yellow tint. Hey Rebecca! If you want to make crystal clear liquid soap, this is not your method, nor your recipe. You’ll need to use the more traditional, labour intensive method and only use clear oils (nothing with a yellow tint like olive oil). Well, I have some batches of liquid soap that are 2+ months old and are showing no signs of spoilage. I haven’t been able to find much information about it online, unfortunately. It may be that the pH acts as a preservative in most cases, but the addition of botanicals, or over-enthusiastic dilution may shorten the shelf life which might be quite lengthy otherwise. I shall keep you all posted if I notice it spoiling. I got my KOH from Saffire Blue—unlike NaOH, I’ve never seen it anywhere other than soaping supply shops. The glycerin needs to be heated to 200 degrees to dissolve the lye. I love this method! This is a GREAT post! 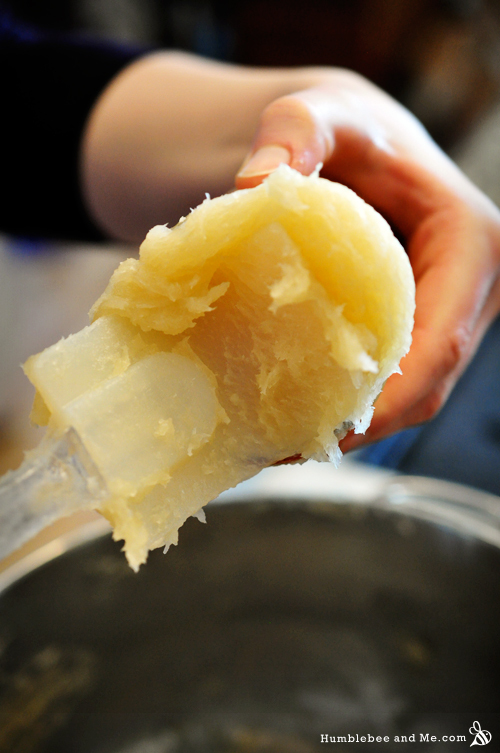 So easy to understand – especially because I usually make hot process soap! I make my own shampoo with Dr. Bronner’s liquid castille soap as the soap base – and your post taught me that if I make my own liquid soap, I can control how thick the liquid soap is (by using less water to soften it) and thereby help my shampoo be less runny! How great would that be?! Question: You mentioned that once you soften the paste with water, the clock is ticking on the soap. How long does it stay good for, and what happens when the clock runs out? Thanks, Tammy! Another note to add to the DIY is that it’s WAY cheaper than Dr. Bronner’s, which is surprisingly expensive. And yes, I am loving my thick, creamy liquid soap experiments—they’re so luxurious, and the lather is amazing because the soap is more concentrated. 2+ months is more than long enough for a bottle of my shampoo, so thanks for that info! My fiance once bought a couple of large batches of customized castille soap from an online vendor. I forgot about using it for about a year. When I remembered it and used it to make my shampoo, the shampoo did not have much lather and it went bad quickly. Thanks to your article and this discussion, now I know why! Your observation about the weaker lather is interesting. Did you get a chance to try it out while it was still “fresh”? I wonder if the advanced age means the soap has broken down enough to weaken the lather? Hmmm. More experiments needed! Yes, I had used it when it was fresh, and it was fine. I think we just had way too much to use in a timely fashion – and it had been stowed away in a place that put it “out of sight, out of mind.” I imagine that what we bought had been made by the same process – a thick paste, then diluted. There may have been some rosemary in it also. I wonder if it would act as a preservative, or if it is a botanical that might speed up spoilage. I think my fiance and I learned a lesson, though, about buying far more than we can use in a timely fashion. Your advice to store the paste and soften/dilute smaller amounts as needed is much more workable. There’s another post of yours from a year ago at least, that I’m following – it still gets new comments to it! In it I commented about my shampoo, in which I use coconut milk. I confess to using canned coconut milk, a brand (Goya) that is the most pure I can find, but it does have a bit of preservative in it. I have suspected that the coconut milk helps the castille soap be a bit more foamy – in the same way that coconut oil in a bar soap helps the bar lather up. But when I made the shampoo with the old castille, it wasn’t sudsy as usual. My fiance thought the milk might have been bad, but I thought it was the soap. Now knowing what you’ve taught me about dilution, I think it was the soap even more! Between this post about making my own liquid soap and being able to control the thickness, and advice on your other post about using guar gum to thicken/emulsify (because my shampoo always separates) (and I remember now – it’s the hair gel post), I’m very excited about the next batch of shampoo. Thanks for all the great info you share! Ah yes, I too am a victim of “out of sight, out of mind”—often with all my ingredients 😛 “ooooh, uucuba butter?! Sweet… totally forgot about that one…” Ha! It’s like a treasure trove in my pantry 😛 Thankfully I’ve yet to lose anything to spoilage yet. I’ve actually made solid 100% olive oil castile soap with a coconut milk base before in an attempt to boost the lather. I’m not convinced it made much of a difference there, haha. Have fun with your homemade liquid soap/shampoo! I’ve got even more sitting downstairs, softening and waiting to be turned into something awesome 😀 I need more free time, haha. Hi. Dr. Bronners liquid soap does not have a preservative, but it does have citric acid and vitamin e. I wonder if spoilage would have anything to do with the superfat? It could be the excess oils that go rancid the same way that can happen with bar soap? Thank you for all the great posts! Hi Heather! Yes, any spoilage you encounter with liquid soap will be from unsaponified oils going rancid as mould can’t grow in such a high pH environment. I haven’t experienced any rancidity with either liquid or bar soap, though. Love your website, and as a bioengineer thought I could give back a little about why soap doesn’t typically support bacterial growth. Bacteria would be very challenged to grow in a concentrated surfactant at any pH, their cellular membranes are a phospholipid bilayer which is held together by weak attractive forces. It is similar to the forces that hold together a droplet of oil when it is submerged in water. Add soap to the water and the oil disperses…same for bacteria, soap/surfactants cause them to fall apart. Some types of bacteria are more resistant to this because of additional membrane structures but all of them would probably prefer to grow elsewhere. Mold (fungi) would be more resistant because of their cell walls but again, not the most friendly environment for raising a lovely little mold family. Hope that helps explain and thanks again for the amazing website! I am also wondering about how long it will stay “good”? I am also curious about the glycerin comment above. How long would that stay good? so the whole adding of something acid to bring the ph down is not really necessary? Since we’re not calculating this recipe to contain excess lye (which produces a soap with a pH high enough to be irritating to the skin), you get to skip that step 🙂 Similar to bar soap, which you don’t have to neutralize either. I am very interested in making a face wash and was wondering since there is no neutralizing step in this mixture, is the soap safe and mild enough to use on your face? Liquid soap is calculates with a lye excess because Potassium Hydroxide is often unpure. It winds up being neutral. I don’t like the idea of excess fat in a water solution, even if it is a soap solution. I wonder about needing a preservative here. Thanks for sharing. 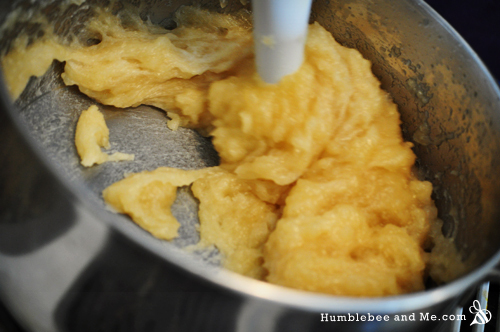 Doesn’t look too hard, but sure seems like the immersion blender and your arm got a workout. Thanks for this great tutorial! I’ve been making liquid soap for the past year, and you are so right: it’s not really as complicated as it sounds. I struggled with all of the mind boggling information out there for a long time. 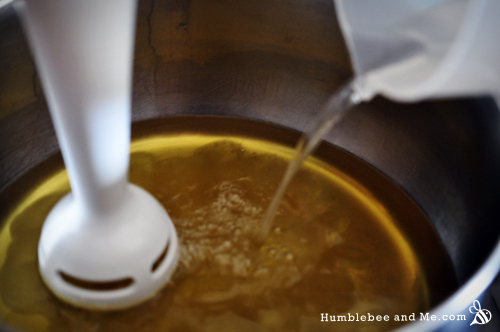 When I finally realized how simple making liquid soap could be, I was a very happy girl =) I use basically the same method as you outlined above, only I cook it in a crock pot and don’t stir it, so it takes a little longer (a couple of hours). I’d personally rather wait than stir. It’s just a matter of preference. Have you had any trouble with your soap separating/forming a skin on top? I dilute my soap with considerably more water than you did, and then thicken it with a salt water solution. By the way, you should try making liquid soap with Hazelnut Oil sometime. It’s my all-time favorite. It sounds like you and I had a similar “squeee!” moment regarding liquid soap, Emerald 🙂 I had a full-on jumping up and down with glee moment, haha. From what I’ve read, and from my experience, the skin comes from over-diluting the soap paste, so that sounds about in line with your experience. Perhaps try using less and see what happens? I’ve finally figured out the whole soap skin problem. My soap forms a skin when it’s at boiling point, and loses the skin when it cools off. Weird, huh? I usually dilute the soap in my crock pot, and if I keep the lid on, no skin forms, but as soon as I lift the lid, a skin instantly forms. Put the lid back on, and the skin will disappear. I probably am over diluting my soap. I’ll have to try using less water. You’re right, it is hard to know exactly how much water is in my soap, because some does evaporate. Thankfully I’ve learned not to stress about it…now that I know that soap making isn’t rocket science! I add some water, turn the crockpot on, and put the lid on. Within about 4 hrs the soap is dissolved. I don’t lose enough water to worry about it, because I have the lid on the crockpot the whole time, and if I lose a little bit, who cares? I have tried the slow soak method, and it is wonderfully worry-free. The reason I don’t normally use it is because…Well, let me do a little explaining. I make soap for my family of five, and we go through a lot of soap. I have a hard time keeping up with the demand. I usually make a pretty big batch – a large crockpot full. Even still, the “big batch” only lasts about 2 months. Seeing that I am very busy with school and life in general, we usually run out of soap before I get a new batch made. So I’m always in a hurry when I’m making liquid soap! Nobody wants to wait for the soap to dissolve – it’s the only soap we use, so when we’re out, we’re stuck! Great work Marie! (as always) can’t wait to try it! I’ve had the proper lye (KOH)for this for sometime, just never the guts to give it a go. This is just the inspiration I needed. Question of the lye and oil temps. Is it necessary to have them approx. equal temps? Is equal temps important at all in HP? I’m going to try your recipe, but using the crockpot method mentioned above. I don’t completely melt my oils – I just pour the hot lye mixture over them when they’re about half-melted and they melt right away. I love this part of liquid soap making—it’s such a nice shortcut after CP! When making liquid soap paste in a crock pot, does a person cook on high or low? I’d hate to burn it, but not sure low has enough oomph to get the job done. I have tried making liquid soap in the past but was turned off by how labor intensive it was. You’re method sounds so much easier than the information I found online, so I will give liquid soap another try this weekend. I’m glad to have inspired you, Dawn 🙂 Have you tried it yet? How did it go? I love how you’ve made liquid soap not seem scary or overly complicated! I want to try this with goat milk. I would assume you would make the paste with the goat milk, not dilute the paste with goat milk (that seems like it would spoil). Do you know if you can sub 100% goat milk for the water? I think I read somewhere up to 25% but I don’t know where! And I love your site, it is really informative and inspiring – I’ve been a longtime lurker. Thanks for the reply. I have to get some potassium hydroxide but am very keen to try. I also made your every day soap recipe (but with goat milk not water). I recently tried it. SO CREAMY!! Tallow was definitely what my soap was missing! Thanks for being such a tallow advocate I was a bit scared of it at first but didn’t want to use palm. I’m so thrilled I’ve got you over on the tallow side now 😉 I just got another 3kg of the stuff because it is amazing… let the soaping marathon continue! I have been banging my head against a wall for the last 6 months! I have been working on a all natural shampoo, doing tons of research on whats good for hair, whats not…testing…blah blah blah. And I FINALLY found one i liked, but not completely in love with just because my hair started shedding again. Not nearly as bad as before with the chemical shampoos or anything, but nomally people loose about 100 hairs a day, and im probably about that or less…but with the shampoo bars i was loosing NONE! Long story short, i’ve been banging my head against a wall trying more things to get the shampoo bar into liquid form (because i hate the waiting period and with a 20 month old…sometimes I cant find time to keep up on soap). I came up with ALMOST this same thing. Same ingredients (because that’s what I use in my bars)…but different measurements 🙂 I just had to tell you…because I couldnt believe it! And I also do it in a double boiler (it’s all i have). I have a question though…any thoughts on the ph level of this or what would happen if we added clay or rosemary infused water with lye or as an extra…? I ask because I normally take a lufa with my body wash and shave while I wash my legs…thinking that the clay would be nice, just dont know if thats possible in a liquid soap. Maybe add it when you are adding water to make it liquid?? Mine has chamomile, horsetail, nettle, jasmine, fenugreek tea, aloe, castile soap, honey, castor, sunflower, EVCO. I just ordered test strips for the ph level so that way I can get a little more scientific with it. I think normal ph levels (that are safe for the scalp) should be within 4-7. So….we will see. Shampoo is a lot harder than I thought it would ever be to make 🙁 I look forward seeing what you come up with, just to combine our ideas, change my thoughts, etc. I have so much love for horsetail these days—it’s a hair miracle herb! Ah…that makes sense! I have always done a rinse afterward….but any suggestions on what or which rinse is best to use of using this as a shampoo? I’m in love with my shine & detangle rinse, it’s amazing 🙂 Anything mildly acidic should do the trick, though. I have been using the liquid soap just fine…but then we got a ‘cold snap’ so it’s in the 60s in our house and the soap is almost completely hard! Any thoughts so that doesnt happen? Or did I do something wrong?? How interesting! My house is often around the same temperature, and I have noticed that liquid soaps that I dilute less than usual end up being on the thicker/creamier side. So, I’d guess you may just need to add some more water for some extra softening 🙂 Ditto for the shampoo—once it softens up more you should be able to get it all blended together. How strange!!! I tried diluting after I wrote you the first time, and it actually turned into a gel mixture. Then actually get somewhat hard again! Almost like goo….I can’t get it like it once was! Ill let you know about this batch (if we get a cold snap again)…but the first batch never did become liquid…even though it was 90 degrees! Just a bunch of goo and gel. Even after adding water to it…. If you have any more ideas on what I might have done…could you let me know so I wont do it again, or I can change something?? I’m really at a loss since it was SUCH a perfect consistency before! Hmm. I can’t say I’ve noticed this, but I’d guess it’s just from agitation over time from the pumping action. Iiiiinteresting. Ok, so, funny story. A day or two after you left your first comment on this I went to soften some more of my paste (which is over 3 months old now) and lo and behold, 60% water was WAY too little. In the end I added 120%! I couldn’t believe it. I think 110% would have been best, as I think it’s a touch too thin now, but still. What on earth is going on? It’s like it’s hardening over time, like CP soap… but not… because it’s not happening because it’s drying out whilst sealed in a jar. WEIRD. I’m almost wondering if the harder fatty acids in the soap paste “come to life” or something as the paste gets older? This will require more research and experimentation… another project is born! From my understanding soap should be between 8–10 on the pH scale. The basic-ness is necessary to impede bacterial growth, so be sure to keep an eye on your soap bottles for mould if they’re registering around neutral. HAHAHAHA it’s so funny you said that…because I went to make more today (to dilute) and I added 100g water to my 100g paste. I dont know how it’s going to turn out…but we will see!!!! Once again, great minds!!! LOL. So, for the mold thing…am I not adding enough lye then?? I’m not really understanding why my dilution is so neutral. I mean, I’m sure adding so much water doesnt help…the more I dilute, the more neutral it would become. But then…that means I’d have to start adding more lye when I make the paste??? Let me know how the 1:1 water:paste thing goes. Hmm. What superfat % are you using for your liquid soap? Are you sure your scale is accurate? My paste tests close to 10 (or at least it did when I first made it, perhaps it’s worth a re-test). What does your paste test at? I made liquid soap once before, following the crockpot method in “Making Liquid Soaps,” and I felt frustrated and unsure the entire time, especially because of the author’s emphasis on making clear soaps, and I don’t care if my soap is clear or not. I just tried your method, and it’s so much easier. Your pictures and descriptions of the stages (curdled milk, pudding, vaseline) made so much sense and really served as a great guide for the process. It also came together way faster than the crock pot method. I used a different recipe for the oils (Luxury Cold Process Shampoo Bar, recalculated for liquid soap) and it still seems to have turned out great. I have two jars of soap paste soaking now, and another nine “put up” for future batches. I’ll let you know how it goes! Thanks so much for all the time and love you put into sharing your ideas — I love this blog! Hi Diana! I am so thrilled that you found my method and instructions to be so useful 🙂 I was so thrilled when I discovered that liquid soap didn’t have to be complicated, there was definitely some jumping up and down and some squealing, haha. Thanks so much for reading & DIYing with me, and enjoy all that liquid soap! In one of these posts the writer mentioned a crock pot method of making liquid soap much like the one shown above but without the stirring. Does anyone have more information on that method? Do you simply not stir at all, not stir as much or not stir part of the time. Also, I use goats milk ice cubes to mix with the sodium hydroxide for my bar soap. Can I do it the same way with potassium hydroxide? Hi Sandy! You basically just cook it in a crockpot at a lower temperature, returning somewhat frequently over the course of several hours to mash it up and stir it. You can read more about it here. From what I have read you can add goats milk to liquid soap paste, but because of the hot processing it goes through, it usually burns to some degree, resulting in a dark brown final soap. I haven’t tried it myself, though 🙂 Let me know if you do! Hi Marie! I made a simple liquid castile recipe (coconut, olive oils) that I found online. My first attempt!! I ran it through mms, The recipe said to melt some sodium soap in the lye water to make things trace up faster. And I added the lye to the almost boiling soapy water. And then the soap traced like mayo in like 10 minutes and then thickened up really fast n never split up or melted down throughout the cooking. I cooked it till the whole thing gelled (about 1.30 hours). 12 hours later it looked pretty fine (what do I know?!) but some oil had leaked out of the gunk. So when I put in Citric acid I didn’t take out that oil and it all looked swell! How do I know if it’s usable? I’ll probably use it to wash dishes or laundry, I guess, but is Ph testing a safe way to know, you think? Sorry for the huge message! Thanks for listening…. Hi Dorey! Congrats on your first batch of liquid soap paste 🙂 That’s always super exciting. The easiest way to test your soap to see if it’s safe is to do a “zap” test—touch a small about of the cool soap paste to your tongue. If you get “zapped” (you’ll know! ), the pH is too high for you to want to use it as is. When I did my first batch I did a zap test and then just used some on my hands to see if it felt like normal soap (I am usually my own guinea pig, haha). All that said, if you are planning on using the soap for dishes and laundry, pH is much less of a worry as your dishes won’t really care if the soaps a bit strong 😛 Thanks for reading! method really makes everything a lot easier and faster! Any advice on what one should do if the soap does “zap?” The jury’s out, really: husband didn’t feel zapped but I did. I think it may be because we had to use an electric stove for this batch, and because it takes a while for the burner to cool, we took it off the burner for a while and then put it on another (smaller) that we’d just turned on, then back to the original as it got down to the low setting. Might that account for a higher Ph level? Do we need to start over, or is there a “fix” for this debatable condition? We can use it, as you say, for laundry and dishes, but I was looking forward to making some of the shampoos you’ve listed that require liquid soap. Thanks! Hi Prudence! The first thing to do is wait a few days—it just might need some time to finish reacting 🙂 It doesn’t sound like your method would effect the pH of final product at all. If, after a few days, the jury is still out, you can try a couple things. One would be doing a test with some pH strips to see where it sits (you probaly won’t want it past 10). Another would be to soften up a batch, use it for a few days on your hands, and see what you think. If you find it irritating, you can try adding a wee bit of something acidic to the softened up batch (citric acid would be easy) to lower the pH a bit. Marie, I’m thinking that maybe the issue could be that I used a soap calculator that adjusts the KOH recommendation according to its usual 90% formulation. I’m in Costa Rica and could only find KOH as “Potasa,” which says it’s 100% potassium hydroxide. Perhaps this formulation is simply 10% higher that what’s usually found in North America? I tried two other batches with similar results, even trying the crock pot method and the double boiler method, and with each I measured oh-so-carefully. With both those methods, though, not only was I “zapped” even after four hours of cooking, but the mixture turned extremely dry. So I’m going with this higher potassium level explanation for now because otherwise I can’t solve the mystery! In any case, I’m glad that your solutions work. And if you have other ideas, I welcome them! Hmm, that would do it! I did calculate mine assuming 100% KOH purity with a 5% superfat and still ended up with a fairly high pH for the soap paste (around 10) before dilution, so I can certainly see how a variation in the purity of the KOH on the side of it being stronger would zap like mad. *So a tad different from what you have as far as oils go and %….but as far as hardness, is 38 where yours is 39 (not a big difference). I did not check my paste when I first made it…but i tried to just now with some paste on there and added a bit of water to make it react and I got between 8-9. Not sure though if that is completely accurate since I had to add water to make the strip react. Conclusion: Obviously adding water to your paste is going to bring down the PH because you are diluting. The Problem: How much water is being added in the end to make it stay liquid. Here’s what I’ve done so far. My first paste to liquid I made how instructed and within a few days…turned hard. Adding water (not boiling) worked…but then would turn to somewhat hard. The more I added the gellier it became until it FINALLY stayed into liquid soap. 2nd liquid soap attempt: 70g water, 100g paste. Took longer for it to ‘harden’, but instead of hardening it was b/w hard and gelly. So, more water DEFINITELY needed! I believe, the only way we are going to be able to get the paste to actually stay liquid WITHOUT going to goo or harden is to add more water than paste. If there is paste left when you to put it into the jar you want to use, there was not enough water to allow the paste to ‘soak in’. Make sense? The PROBLEM!!! I know for a fact I am probably over 100g of water at this point…because you have to add water to make sure the paste melts. IF testing the paste was correct (what i stated earlier b/w 8-9)….then adding what I have added thus far has brought it down to b/w 7-8 PH. Which is why I am wondering if adding more lye in the beginning would allow for the extra water without the dramatic drop of the PH. **If this testing works, I will FOR SURE keep track of how much ‘extra’ water I am adding to the 100g I started with. Right now, if I had to guess…i’d be in 120g range. But again that’s only a guess. I am still noticing a bit of paste that has not melted….so I have added a tad more boiling water to the mix to see if that will melt the rest. My personal thought is that if you have less water than paste…that paste finally soaks it all in and starts to harden. Adding more water than paste (and not interfering by smooshing it to melt), allows the paste to soak everything in and stay liquid…. Hmmm. Sounds like I need to make up a great big batch of soap paste and have an experiment here! Hmmmm. I have been thinking on this, and I definitely need to do some more experiments with different types of soap paste and see if I can find any kind of pattern :/ I’ve had no luck getting useable (aka not just like water) textures by diluting the paste with over 100% water. I wonder if ambient humidity might be a factor? Hi Danuta! Three whats of sodium lactate? I’ve been finding my dilution levels can vary hugely based on the formula used for the soap paste, and even the rate at which water is added to the paste. More experiments are needed! So it’s been a few days now…and no sign of it hardening or turning to goo. I would reheat water and add a bit until all the soap is dissolved on its own. So right now it’s looking good. Again, I am not sure how much water that is…but 100g of paste ended up making me a little more than half of a 8oz mason jar. If that gives you an idea?? Here’s a question im going to throw out at you….you think that this paste could be used in laundry soap?? I am currently working on one now with coconut oil soap…but I am thinking if I just make enough of this paste, I could use this paste instead….then add washing soda. Thoughts?? Iiiinteresting. Who’d have thought the softening stage would be the most frustrating? I would think you must be able to use liquid soap as a laundry soap, provided you made a batch at 0% superfat. or what about even a few squirts of the liquid with washing soda added?? I wonder how the ratio there would work out? Just that liquid soap, once diluted, is far less potent that grated up bar soap. Hi! I tried to make the mommypotamus shampoo – which is AMAZING as a bar, but I kinda miss runny liquid shampoo- twice. and it never went vaseline-y or made a paste. I was kinda wondering about this too… It makes a muddy thick thing that works in the shower but it kinda looks like chocolate milk instead of something appealing to wash your head with, too! Are your hot processing that recipe, Dorey? I’m assuming so since you’re talking about vaseline-y-ness? Are you using NaOH or KOH? I must admit I’m a bit confused because you called it a “muddy thick thing” and not a bar… but then you said it was a bar? If it has a milk in it, that might explain why it’s dark—I have read that hot processed milk soaps can be very dark due to the cooking/scorching of the milk. I dont think i saw this asked above or maybe i missed it, if i did sorry. Can you use naoh instead of koh and it still come out right? I don’t know the chemical process of this, but one person has a liquid soap recipe that is made with the NaOH, and states it can be used immediately. It seems to fly in the face of every other recipe and instruction regarding use of Lye and I would be cautious about trying it. 1. 90% KOH- I read somewhere that most KOH purchased is 90% unless otherwise stated, Is this correct and did you use that setting? 2. What water:lye ratio did you use? (3:1)? 3. Did you get a final pH of your soap after dilution? I came across Summer Bee Meadow’s soap calc mentioned in an article and my results in their calc is different than soapcalc. As Summer Bee has an excellent rationale for how their calc is set up, I’m going with theirs. You have provided such excellent, clear how to instructions with the making. I was greatly alarmed when I noticed my numbers were not looking right on soapcalc and I am thankful I did some extra research! Wish me luck! Hi Sabrina! I have read the 90% thing as well, but I can’t really say for sure if it’s true as I’m not in a position to test my KOH for purity. I used SoapCalc’s KOH setting when calculating, but did not make any calculation changes other than that (I did not check their “90% KOH” box). As for water, I used SoapCalc’s default setting, which is 38%. I know the pH of my final soap is below 10, but I haven’t invested in precise pH strips, so I can’t say exactly. Thanks for reading & soaping with me! 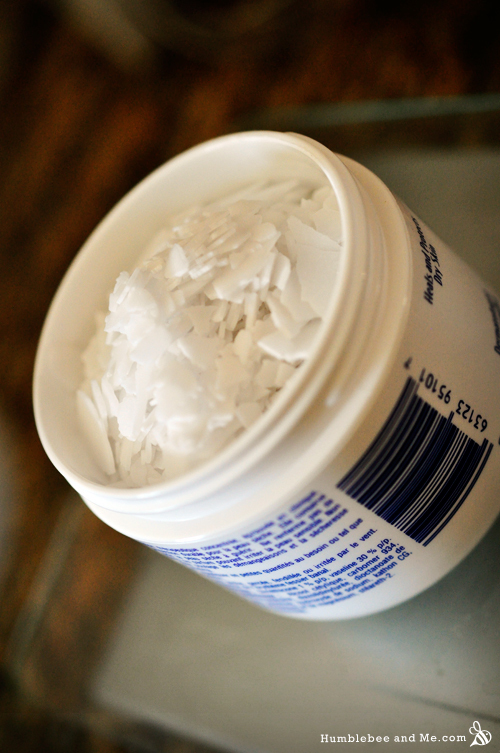 Also wondering about adding sugar or salt in the lye portion for more lather… Have you tried this? This morning, I started the liquid castile with glycerin. The big batch, just like the recipe above. I always work with the lye outside, upwind. I put a stainless steel pot on the outdoor gas grill, put in the glycerine, 6 teaspoons of sugar and the KOH. Heated it up until the lye dissolved. The sugar carmelized and made the lye mixture kind of orange. I had my oil in the crock pot on low setting. Slowly poured the lye mixture into the oil and ran the stick blender for probably about 7 to 10 minutes. The mixture went to the glossy taffy look within that time. Glycerin really did speed up that process. Now I’m just letting it cook through in the crock on a low temperature. The batch gelled, and is too big to stir, so I have to let it process by cooking. I’m hoping this will be more moisturizing! I completed the cook, and ended up with 10lbs of soap paste. Broke up and saved 6 containers of 1.5 lbs soap paste, and started melting the remaining lb of paste. Finished cooking that up today (because I don’t mash, I let the crock do all the work). We measured the ph with our ph meter before neutralizing and it registered an 8! That is very impressive. The water formula we made before was a 10 before neutralizing. I think I’ll be sticking with the glycerin version. All in all, the cost of the oil, KOH and glycerin was probably $30 – $35. It’s not usually about saving money when making this myself, but an easy 4 gallons of castile soap (which could cost $200 retail) is a good deal for me! I’m looking forward to making some shampoo and other stuff! You’ve definitely convinced me to give this a go 😀 Can’t wait until I have to place another order! Sugar did not help with suds. This is a no bubble concoction. I did get some red turkey oil to add and see if it works as a “shampoo”. No bubbles at all? That’s rather sad. Perhaps try adding some (more) castor and/or coconut oil? Those are my no-fail lather adders 🙂 I look forward to hearing how the TRO works! Interesting… since glycerin is a humectant, I wonder if it would actually slow the cure process of a bar soap as it would attract water to the bar? I haven’t tried straight sugar, but I have used molasses in soap, and had at least two bad experiences with honey that scared me off it for a while. If you want to add sugar I would definitely recommend soaping at room temperature! @marie: what happened with the honey that was bad? Was this in a liquid soap or CP bar? I use honey fairly often (I just don’t use that much) and wanted to increase the amount I’ve been using. It’s not that it’s bad, it’s just that it makes soap batter do strange things (mostly involving being too hot). Mine was a CP batch (and the second one I ever did, to be fair—I had practically no idea what I was doing, haha) and it immediately caused the batch to split on me; it sort of looked like watery ricotta cheese. I poured it into the mould anyways and while it did saponify it was crumbly and a lot of the oil separated out (my best guess is that it was all the superfat oil). Here’s a photo of the ugly batch 😛 I tried again, it happened again, and I haven’t tried since 😛 I am working up the nerve to give it another go, though, now that it’s been a few years and I’m soaping at room temperature, which should help as sugar causes soap to process extra hot, which is a big part of what can ruin things. I finally got some KOH, I am so excited! I was wondering, what else can I use it for? Also, does the paste get hard? If yes, how do you get it out of the jar? :/ If not, is it better to leave it that way, and just dilute&soak when want to make a new batch of liquid soap? Hi Andrea! Yay for KOH 🙂 I use mine for whipped soap base as well as liquid soap base 🙂 Neither pastes get too hard, but I would recommend storing them in a wider-mouthed jar or container for the easiest scooping. I just use a spoon. Liquid soap paste ends up sort of like vaseline, whereas whipped soap base is like slightly dried out play-doh. Wondering if you’ve ever tried your method with goat milk or anything similar? Hi Laura! I haven’t, and for pretty much exactly the reasons you outlined—cooking milk for that long just seems like a recipe for disaster (or cheese…). I do plan on trying it, but with a small batch, and/or perhaps with powdered milk. Wow!!! What a lot of comments to get through to make one!!! Congrats!!! And I am 150% proud as punch to say to you… I finally made it!!!! But I don’t think my immersion blender will stand up to more than one or two more batches. I never made it to the translucent Vaseline phase… have no idea why. But after about 30 minutes of trace cooking (so need to coin that phrase!!) I gave in and did a zap test… and it tasted horrible, but no zing. I had to get over my fear of electricity to actually do the zap test. They really need to call it something else. Zap. Reminds me of the sound when the wire short out. Anyways… decided to make some new shower soap with it, made it 1:1 and added in a huge hunk of cocoa butter and a bunch of the pepermint crystals. I cannot wait till tomorrow morning so I can use it!!!!!!! Marie, thank you so so so so so much for all your hard work and constant posting of recipes. I know without you posting this recipe and the instructions, I would never have had the nerve to make liquid soap. Well, the cocoa butter and peppermint turned out so amazing!!! And because I am working with such small amounts, it has allowed me to experiment much more easily than with cold processed soap. Not to mention that instant gratification thingie I have going on. When I make CP soap I like to stand in my soap room (yup. I actually have a soap room and that is why I rent this apartment) with my morning cup of coffee and enjoy the scents and the various shades of the countless bars of soap (currently my favourite is a Christmassy one that is scented with various essential oils: cedar and pine with a very faint orange note. This soap in a butter yellow on one side and a French green + Bentonite clay on the other. I used an approx 1:1 ratio of liquid soap base to water. I usually work in 100g amounts. I take out the immersion blender and quick burst it after one night of dilution. I slowly add in about 50g of a butter (usually cocoa butter as I have so much of it and nothing much to do with it right now and I am afraid it will go off on me soon!) so everything has a slight chocolatey- ok strong- chocolately note too. And zip it with the blender trying not to make too many bubbles. I let it stand for about an hour, then drop in the essential oils and other items I want to add in. So this morning I was playing around and the creative light bulb went off. In the coffee grinder, I put in some ground ginger (I recommend drying your own as it seems to have more of a ginger scent that way), some cloves, black tea, cinnamon, cardamon, a couple mustard seeds and zipped them till everything was a very fine powder. I added in some clove essential oil (about 10 drops), cinnamon essential oil (10 drops) and a drop of black pepper essential oil. Mixed it all up and let it sit there. Then got a huge brain fart! Add in some coffee and make it like a soap frappe! So now it is sitting in the bathroom in a fancy little exfoliation container from The Body Shop. My own personal Chai Latte Brew. I am thinking of making another huge pot of this base and gifting a small bottle of it to all my co-workers for Christmas as the girls who I gave some of the peppermint chocolate too fell in love with it. And now I cannot wait to make the whipped soap! But I think I might leave that till after my Mexico trip. Haven’t had time to read all the comments, but it’s important to note that KOH is not typically 100% pure and one needs to select the appropriate % in SoapCalc … I get my KOH etc from Voyageur and the % of KOH is clearly marked on the label. Good call, Bernice! Be sure to check your labels and/or check with your supplier to see if you can get concentration information as well. I’m not sure what (if anything) I did wrong. Mine took 20 minutes to get to completion after I added the lye water. Not long at all. It did all of the things you describe except one more. Just before it went opaque, my huge pot with a tiny bit of soap turned into a soap volcano. I had the stove on the lowest possible heat. It’s an old stove, maybe low was still too hot. Either way, it all ended up opaque, i managed to scrape most of it off of the stove and washing up was easy – just add water!! I just made this soap paste this evening and also encountered the soap volcano! 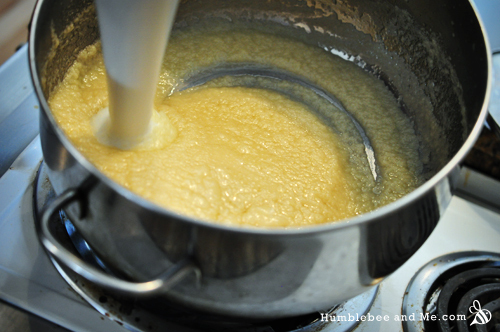 It happened right after the curdled milk turned into a smooth applesauce, and then it started to foam up, up and out of the pot (I would say the liquid was pretty low to begin with, maybe 1/4 of the total volume of the pot I used, but it volcano-ed about 6 times its size. There is a part on that page that says “Now this is a stage you have to look out for. This is what your soap looks like just before it starts to puff up and out of the pot. What happens is that the soap gets too hot …and it doubles in size.” It seems that once you notice the paste starting to rise, to take it off the heat and try and cool it off; next time I’ll prepare an ice bath in the sink for such an occasion. Hope this helps! The remainder of my paste that stayed in the pot finished just fine and I’m excited to see what my liquid soap looks like after it dilutes! Thanks so much for reading, following, and DIYing with me! I was just coming here to write about my experience as well! I think I reached traced in like 7 minutes; luckily I didn’t boil over as I noticed the soap rising towards the top of my pot I quickly took it off the burner for while and then transferred back. I had my stove set to 2/10 as recommended but I think the pot I got from value village was TOO good a quality! It’s made in Canada, has a super thick magnetic bottom and obviously retains heat REALLY well. I kept the immersion blender in a bit too long because I was expecting to use it for 20 minutes or so (not quite realizing I had moved things along super fast) so the inside mechanism fell out into my pot! I switched to a spatula and fished out the pieces and then manually cooked for about 10-15 minutes until I reached the last stage… I never really went through a super translucent stage though. — Maybe that has to do with the higher heat? In any case, I’m wondering if the fact that things were moved along faster with a higher heat will it change the overall way the soap works? I’m obviously planning on making most of your liquid soap paste recipes so want to know if I should be doing anything differently! I have also added about 115g of water to 100g of soap paste to soften so far (about 12 hours so far) hopefully I’m not just being impatient and adding too much lol! Hmm. I couldn’t say if a faster cook would effect the outcome significantly. As long as it passes the zap test I imagine you should be fine… hmm. Keep me posted if not? So far I’ve made the Silk & Cedar Shampoo and I absolutely LOVE it; my hair is detoxing, but surprisingly with this shampoo and the Shine & Detangle (with the silk and phytokeratin) rinse I’m not doing too bad! (and I Just finished making the bamboo & silk milk to add to it!) You make going au natural easy peasy! So all in all, I’d say it turned out just fine! Is it possible to remove it from the recipe? Will the soap still foam? Hi Sara! You aren’t the first reader with a coconut allergy, believe me. You should look into babassu oil—it’s the only swap I know of that works similarly, but isn’t coconut oil. In any event, all soaps will lather, with or without coconut oil, it’ll just be a lower, less bubbly lather. Hi, just wanted to chime in. I read the comment about the volcano (and I’ve not been following this too closely so I apologize if I’ve commented incorrectly) – but, TEMP is very important. I’ve not had good results myself using the double boiler method (while others have). I use a crock pot that maintains a constant 180deg F. Higher than this can cause volcanos. I make liquids quite a bit. When I use glycerin in stead of water my cook time all in is about 1.5 – 2 hours for 4 LB’s of soap base. When I use distilled water and KOH it’s about double that for time. My stove is ancient, so the temp probably did go too high. I’m also using well water, which is probably loaded with all kinds of minerals. It’s UV treated and filtered for potability, but that’s not going to take all of the minerals out. Perhaps I should invest in a new one! Do you take the temp while you are cooking it? If so, can you post some readings? I’ve had the best results around 180deg in my area but lower (160ish has also worked out but takes longer). The key variables that need to be consistent are: temp, the koh and the water. I usually only take the temps to make sure the lye and fats are the same temp before combining. it’s a good idea. Next time I will – not this weekend but next. I’ll let you know! (for example, with cold process, most people combine their fats and liquids around 100 to 120deg, but for liquids, I do it at 170 or so (the temp gets things going but above 180 is dangerous). I’m making a batch in December – I’ll try to take some photos or a time lapse of the trace and cook. Hi Debbie! Does your paste pass the zap test? What is the texture like now? I doubt you burnt it as most oils don’t burn until they get very hot indeed. Hmmm. Love your site! Read the remarks and will order the KOH. So, is there a clear winner between the water or glycerin? Also, does this liquid soap lather up? It seemed that some of the comments were that it didn’t. Thanks!! I’ve successfully made my first batch using olive oil, coconut oil and mango butter. I diluted some and added lemongrass essential oil and we are using it now. I diluted some with orange essential oil. The problem is that the underlying smell of soap is too strong. I used 80 drops of essential oil. I’m wondering if the smell of the mango butter is the problem. It’s expiry date is 2016 but it smells quite strong. PS I didn’t notice that your excellent instructions said to use a large pan. The whole lot overflowed. It took the same time to clear up as to make the soap! Hi Marie. I made 500g, although I had to add more water than in the recipe, possibly because I made it very thick. The supplier of the Mango Butter is Justasoap. They are checking the mango butter batch, just in case. Most helpful. Until they get back to me, I was thinking of making some liquid soap with just olive oil and coconut oil, as it’s getting near Xmas. With a 500g batch I’d say 80 drops of essential oil is nowhere near enough. I find soap to have a fairly pronounced soap smell, so it needs more EOs than a batch of lotion of a comparable size would. Just keep adding more EOs and I imagine you’ll find the scent of the soap itself fades away. As an update, I am using the orange liquid soap now. It works well and has a better smell after leaving it a few days. But it feels oily when you first apply it. Could this be the essential oil? Also, both mixes separate after a day, with a narrow layer of what I presume is water at the bottom. I have bought some nice dispensers for presents but am reticent to fill them with a new batch I plan on making until I get the separation sorted out. Hi Andrew! Did you add any extra oils to the soap after softening it? That could be contributing to the oily feeling. Otherwise is it possible that it feels more, err, slimy than oily? From what I have read, separation is a symptom of a not-quite-right dilution level. Try experimenting until you find a ratio that works for the formula you’re working with, and take notes! I am doing similar experiments myself right now. I was relieved to see I wouldn’t have to render any tallow for this, because extra steps, and yay all I need is the KOH! I’m still trying to find where the heck I can buy the lye locally… But do you use just the plain-jane olive oil from the grocery/cosco? Is it virgin/Evoo? Anything special to keep in mind? I’m really excited to try this out! I already have the calendula for one of your shampoos! Hi KM! Well, I would recommend doing a CP soap first if you’ve never made soap ever before as it requires a lot less work, and trace is easier to recognize with NaOH than KOH soaps. You can just use a shoe box lined with cling film or parchment for a make-shift mould if need be. The olive oil I use is from Costco—the cheaper stuff that comes in a two pack. Pomace will have a different SAP value than virgin/extra virgin, but that’s the only thing you really have to watch out for. I am just beginning my foray into soap making. My daughters have severe allergies to many, many things (they are practically bubble girls). Up until recently I have been able to purchase gentle, allergy friendly soaps to use on them, however we have been experiencing some new reactions this year and I am trying to rule some things out. In this process I need to know every ingredient they eat, touch, smell, feel – which has led me to soap making. I see that you have recommended babassu as a good coconut oil replacement in a previous comment, but I was wondering if you have any suggestions for replacing olive oil and shea butter. I have read your post on substitutions and I’m wondering which characteristics are key when substituting in soap making (I realize I may be over simplifying a question). Here are some options that would would work within my limitations for liquid oils; grapeseed oil, almond oil, avocado oil, apricot kernel oil, sunflower oil (all are fairly delicate, from what I can gather) and probably others, but these are the most common. I haven’t experimented with soft oils too much, but I’m going to test out cupuacu butter and babassu oil, both are low on the allergenic scale. I am also considering unrefined red palm oil. Any thoughts or hazards I should consider? Do you think it will be possible for me to formulate something within my limitations? Thanks so much for your thoughtful reply. I will play around with SoapCalc and see what I can come up with. I love your blog, BTW. Hi – any update on making this with milk instead of water? Sorry, no! I have been meaning to go back and make more liquid soap paste for ages now, but still haven’t gotten around to it. Any ideas on why it’s doing this? I have made liquid soap before that did not do this. But i misplaced the method/recipe. Hi Nickolas! Separation is often caused by over-dilution of the soap paste. Have you tried working up to your final dilution by adding a little water at a time, waiting a few hours for it to absorb, and continuing on until you reach the perfect dilution level? Thanks for the response, no i admit i was a little impatient. 1:0.6 seemed crazy low once the water was in there, ended up adding loads of water, the viscosity is quite low now. Can i rescue this lot or is it too late? That might do it 🙂 You can try putting the soap into an oven safe glass bowl and baking at a low temperature (~200°F) covered with foil for a few hours. I have tried the oven slow cook as a softening method before and found I usually ended up just drying everything out rather than diluting it… so that could work! Hello. I tried this recipe and all seemed well at first. I got the liquid soap diluted to my liking. My boyfriend used it in the shower last night. Then today when I got home from work, the soap in the bottle was almost the consistency of lard. I’m not sure what I’ve done wrong. Any ideas? Hi Bonnie, I’m in the same boat. Did the slow soak/dilution route, added some vit E and grapefruit eo, poured it in the pump bottle, used some, thought to myself “this is a little thin”. Well this morning it is almost solid again, had to add some warm water and stir it around with a chopstick( only thing to fit in pump bottles)! Any one else with this experience, solutions? Can it be the eo’s? Please don’t take offense….but did you all use the right Lye? yup, right “lye”, even had to take the tape off the lid, KOH is the large flakes. I did notice that SoapCalc has two variables for KOH so I am going to ask the nice people at Candora Soap if they know whether what I have is full strength or the 90%. I know with CP soap that some e/o’s will accelerate trace, so maybe they can thicken our liquid soaps? I will try a different e/o on the next dilution. This is interesting because it’s precisely the opposite of what I’ve observed—for me it seems like the soap can loosen up over time (especially if you add anything that contains alcohol!). Hmmm. I must experiment more. Hmm. This is rather odd. Were there any big temperature changes? Hmmmmm. So now I have soap paste at 15% superfat, any thoughts on using it as is, or is that too high? I could make another batch at 0% and blend the two when I soften the paste for shampoo, bodywash etc. Any and all suggestions requested. Hmm. What’s the pH? If it’s above 9 or so you should be ok. How much did you make? If you don’t have TONS on hand I would recommend shifting into operation “use only this soap” for a week or two and using it all up. If there is a ton, you might look at some other projects with it—especially if it’s behaving more like whipped soap base (it sort of sounds like it might be). You could try turning it into cleansing balm (minus adding oils) and/or whipped soap, and then gift things if need be. No, not tons, started with 1000g oil. I will trial the cleansing balm, and if that works make some more for my sister. So I am new to liquid soap making and I am curious about this process… From what I can tell it’s exactly the same process as every other liquid soap recipe I have found, the only difference is that in this recipe, once you cook the paste you can dilute and use right away… Whereas the other recipes call for cooking the paste for 6 hours in a crockpot, immediate dilution of the paste, and the they tell you to wait 1-2 weeks before you use it. So, here my question: why is your process different, and safe to use right away? I can’t really figure it out. Mine is basically just a hotter, faster processing of the paste. It’s perfectly safe to use as all the KOH is neutralized in the cook process, the reason some sources tell you to wait is to let sediment settle out of the soap, so it’s purely aesthetic. I love your website! Thank you for all of your wonderful recipes! I have been making bar soap for a while. I make shampoo bars, also. I love the bars for body and hair and really want to share with my family, however some of them are just not interested in trying a shampoo bar, despite how lovely it is for hair and scalp!! Probably due to the habit of liquid shampoo! I also make laundry bars and dish bars (100% coconut oil!). I love them, but the dish bar leaves a residue or spots on the dishes…. 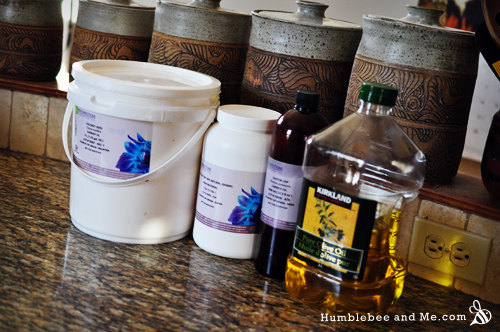 SO – I am ready to make liquid soap…. I have KOH. I feel ready, but…. 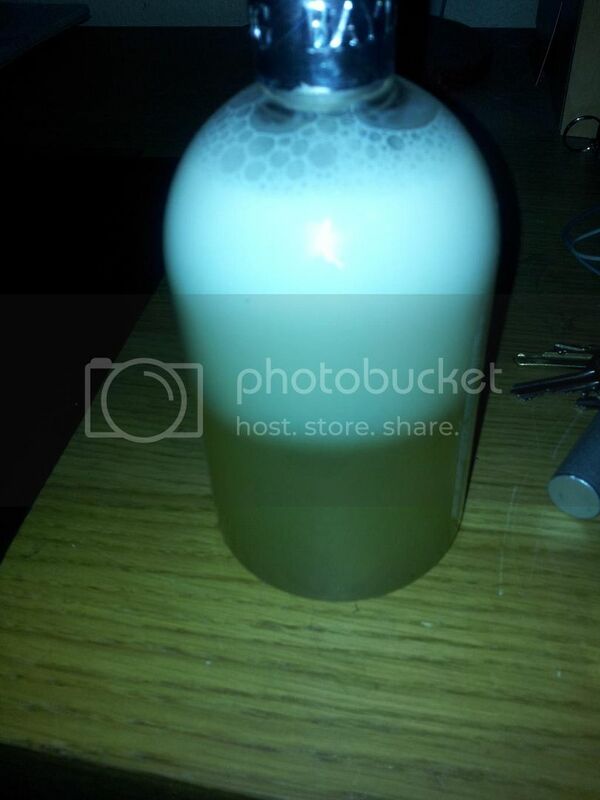 I really want to make this liquid soap as moisturizing as the bars are….. I use coconut milk and aloe vera juice instead of water… Sometimes goat’s milk…. How do I do this with liquid? I do not at all care what the color is or even the scent. I only care that it will not be drying. Some relatives and friends have very dry skin. Any advice you can give would be great!!! Thank you SO much!!! Hi Cindy! Once you get into making liquid soap you’ll find that it’s flexible in ways bar soap isn’t 🙂 You can easily superfat after saponification and add goodies like honey without worrying about over-heating. That said, there are limitations because it is liquid. I wouldn’t recommend adding milks as I’d be concerned about them spoiling quite promptly (think about leaving milk out at room temperature). Aloe vera juice should be fine to use instead of water, but milks will scorch during the hot cook and likely not be much good after that anyways. I don’t know what the hell happened! I made mine with the right ratios (I will say I added 1 extra gram of castor oil by accident). My mixture, with water, was 1/3 the size of my pot. Everything seemed to be going ok, and it started to swell in size after about 7 minutes over low heat and blending. It kept swelling and swelling and I had to do a fast dump to a much larger pot 3x the size of the first one. Then within 2 minutes it did it again! I had to hold my bubbling pot over the sink and let it drip out. It finally seemed to calm down and everything seemed to go back to plan. I tested it on my tongue and it didn’t zap, so I’ll try it out, but do you have any idea what was going on? It sounds like it got too hot :/ Were you using low heat and a heavy pot? A heavy pot will help with even heat distribution and help avoid hotspots. Its possible it was too hot. The pot was certainly heavy enough. When I try again I’ll keep it even lower. Also, I’ve been combing through these comments and found the same thing re: water to soap ratio. I nearly double the amount of water to liquid soap and still find it solidifies into a gel. what have you found in your experience thus far? With all the differing feedback I’m getting on softening (works great for some, others have challenges) I think I need to do some more experimenting with the recipe, and perhaps try and break the technique a bit 😛 Stay tuned! Hi Marie! I do not see in this recipe what to enter into soapcalc for the water as % of oils…..Do I leave it 38% or should it be different for liquid soap than it is for bar soap??? Thanks! Just leave it at 38% 🙂 Easy peasy! Thanks for the great tutorial! I have done a few batches of liquid soap the long hard drawn out way. They are still curing but beautifully clear. Do I care if its clear? Not really. Just wanted a quick, easy liquid castile soap I could use now for other projects. My hair won’t care if it’s clear, and I doubt the dogs will mind when I make them some neem oil shampoo. Thanks for sharing this! Hi HumbleBee. This process looks amazing. But there are a couple of things that concern me. First is the use of Soap Calc. You didn’t mention clicking both KOH buttons. This is imperative in liquid soap making to ensure the correct amount of KOH is calculated. Otherwise you’re soap is heavily superfatted by as much as 10%, due to the intrinsic nature of KOH. Second, superfatting in LS at all is touch and go, with 5% being a smidgen too much. 3% is ideal to ensure no free lye, and no clouding. I know many folks don’t care about clouding, but too much clouding from excess fats can cause problems later on, such as separation. Lastly, the high Shea content. Shea contains a lot of stearic and unsaponifiables, which can also cloud the soap. With that, you won’t know if your soap is truly done without an accurate clarity test. The pH Testing is necessary to ensure the soap is completely cooked and saponified. A 3 hours cook time, regardless of method, is warranted. KOH needs that time to do its job. For those who had issues with volcanoes, the stove top method can do this, as it produces inconsistent heat only from the bottom of the pot, compared to a crock pot. Heat gets trapped in cool soap pockets and expands. I just had a lady in a soap group have this issue as well after following this tutorial she looked, so I figured I’d check this out. Btw I absolutely love your blog! Today I tried out the liquid soap which I also had had swirling in the back of my mind for quite some time. And… I got it cooked up in les than ten minutes! Hey Iida! I’m curious to hear how your soap is doing now that’s it’s been a couple months… ten minutes is a realllllly short cook time and I’m kind of worried that not everything that was supposed to happen (chemistry wise) did. Oh Help! I haven’t made liquid soap before, so I thought this easy version would be a good way to start. I’m using 60% olive oil, 30% coconut and 10% tallow – because I had it on hand and because I like a nice creamy lather. I ran it though three calculators and they all agreed on about 13 oz water and 4.5 oz KOH. Everything went fine and I was at a thick mash potato within 15 mins. And there I have been for 45 mins. My arms ache and I’m nowhere near a translucent Vaseline. It smells and feels like soap (got some on my hand & washed it off). I tried a zap test and no zap. Granted, I’ve never done that before, so I wasn’t sure what to expect. I don’t want to burn it (is that possible?) but I don’t want to give up and waste it all. What can I do??? Hey Kallisto! You might not be getting to the translucent stage because of the tallow, though I can’t stay for sure. If it’s not zapping, I’d pull it off the heat, let it cool, and try diluting it later. If it zaps, you may be able to save it by adding some citric acid to lower to pH (some pH strips may be in order to figure out where you are and where you’re going). definitely add the lye water mixture very slowly to the oils…….. 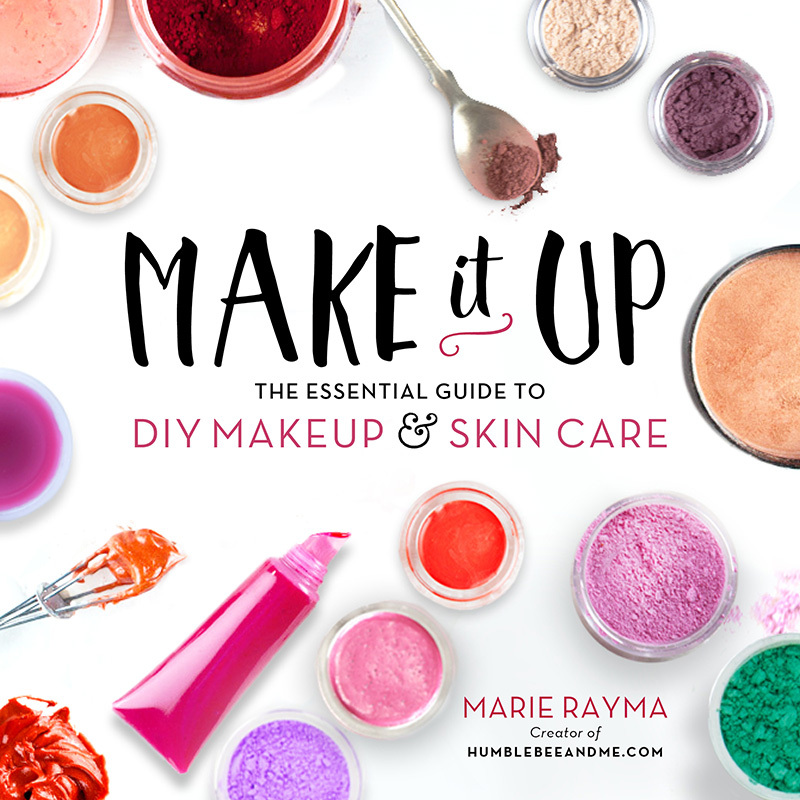 I had my first diy disaster….. Total soap explosion. After I realized I wasn’t going to burn the house down or anything I had a great laugh and a lot of clean up!!!!!!!! I love your site and am so thankful for such an awesome hobby. Thank you Marie for such an awesome site chock full of info, awesome descriptions, and great pictures. I look forward to many more diy adventures!!!!! Whoops! If nothing else, I imagine you have very clean counters now 😉 Thanks so much for reading & DIYing with me! I have been playing around with a lot of batch’s of liquid soap, made with different blends of oils/butters and your method. I find it works brilliantly regardless of the oils used. I have found the dilution ratios can be anywhere from 1:2 to 1:6 (soap:water), the more harder oils the more water required. Have been experimenting with a lot if the recipes on your website and love them. Decided to try liquid soap paste tonight. During thr zap test I did get zapped. What do I need to do to fix this? Didnt find anything in the recipe to help with this. Thanks. So, I think we just tested it to soon because after about 20 minutes we did the zap test again and nothing happened. However, if you any comments or tips please feel free to let me know. Thanks!! This may seem like a silly question, but can this be used for body wash in the shower or is this just hand soap? There’s really no such thing as a soap that can only be used on hands (or anywhere else on your body, that is). You might find some scrubbier ones aren’t well suited to the face, but that about it. So I finally got around to this. I’m so thankful for your pictures, I was surprised by how long it took me to get to the translucent paste stage. I have a very important questing though. I did the zap test and didn’t get zapped, but my tongue is rather irritated, telling me my soap is at least strong. I’m going to get some ph strips to test, but how do I adjust the ph after the soap is all cooked? What works well to add? I’m primarily going to use it for shampoo and hand soap in the bathroom. I think the problem is I calculated for 90% KOH, whereas I think I saw you assumed yours was pure. I ended up with about double the lye vs what’s noted in your pic in the post. But by the time I realized that it was to late to turn back. So how can I bring down the ph of my final, deluded product if the soap paste is a bit strong? Okay… so I’m double checking and it’s not double, but 109g vs your 98g, so I’m a little less freaked out. Also, I did superfat as instructed. I’m very interested to know why so many people are finding a wide variance in the amount of water needed to thin the paste out. Any new thoughts or findings on this? This is becoming a pretty common problem and I’m thinking I may need to work on this paste to make it more dilute-able. Stay tuned… at least this stuff is great for cleansing balms! Oh my gosh, yes, I (and my face) love the cleansing balm I whipped up! I did a split of cocoa and Shea butters as a cross of both your recipes cause I just couldn’t chose. ;D And I did use some orange peal powder a mild exfoliant. Thanks for the citric acid tip. It’s on my list for my next nda order (I want to try the hair rinse powder too). And the deluded soaps are working very well. It’s almost like my shampoo just need some time to get its act together. 🙂 And we’re happily using the mint hand soap in the bathroom. It’s wonderful! Fantastic! I definitely love the cleansing balms as well—especially for travel. And I’m so glad your liquid soap paste ended up diluting out well. Phew! I was wondering what your thoughts are on preservatives and thickeners. (apologies if it was answered in previous comments). I’m specifically trying to make shampoo, found a lot of info on gums and all other thickeners… Read that salt works quite well for naturally thickening liquid soap and acts as a mild preservative. I see though that you don’t add any thickener at all? So perhaps it’s not even necessary?? Hi Lizl! If you get the dilution level right, you won’t need a thickener 🙂 You also shouldn’t need a preservative as soap has a high pH that prevents bacterial growth. Thanks for responding to each and everyone of us.. don’t know how you do all this in our modern ‘busy’ lives. Surely inspiring. This is probably a stupid question but I was wondering if you could dilute the paste with anything other than water? (milk, herbal teas etc) I’ve been playing around with cold process soap for a little while and love seeing what differences I can make with using different things for the liquid. (My favourite so far is cream, about 25% of my liquid, added at trace) Would love to carry this experimenting over to liquid soap but would it be risking the soap going bad quickly? Should I just make the paste with whatever liquid and use water to dilute? Hi Christina! Without the liquid being involved in the lye/cook process, I would stay faaaaar away from anything than can curdle/mould/go icky here. CP soap is different as the high pH and low liquid level make it pretty impossible for bacteria to thrive, but that’s not the case with liquid soap, sadly. Tea, aloe vera juice, and witch hazel would likely work, but even then I’d start small and keep a close eye on things. each time i try to make it, it almost be solid like a gel. each time i increase amount of water in soap but after a few minutes its be solid. Have you ever managed to add too much water? I was looking for some information on liquid soap making today when I came across your post How to Make Basic Liquid Soap (The Easy Way). It’s funny I actually just published an article on 5 Principals That Will Immediately Improve and Simplify Your Liquid Soap Projects last week. Let me know if you want to check it out. Do you have to use castor oil or is there a good substitute? Also, what do you mean by 5% superfat or lye discount? I am new to this process and am constantly looking for alternatives to store bought items. I am not sure if anyone else has mentioned this, but you can speed up the process of making liquid soap by adding some of the previous batch of paste. I add about 1/4 the amount of oils in the pot. The amount doesn’t need to be exact. 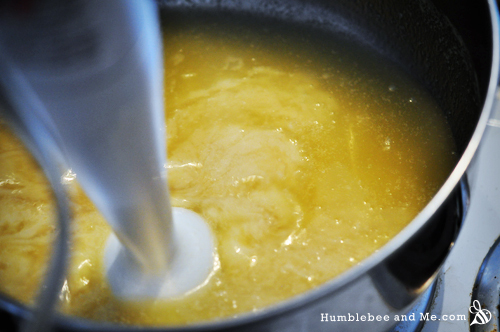 I use a stick blender to mix oils and lye in a stock pot, adding the paste after a few minutes and mixing well. I then put the lot in a crock pot for about 3 hours, stirring every so often. hi again marie! i have been so intimated to make liquid soap but this recipe seems simple enough. i just ordered my koh flakes 😀 i can’t wait to try this for my next project. question: do you think it would be okay to use african black soap instead of shea butter for this recipe? i ask because i love african black soap and have a bunch i want to get rid of.. i hate how messy it is and how it just turns into a pile of goo after using it in the shower. i want to make a liquid version of african black soap, but i am not sure how to go about doing that. i have seen several youtubers just soaking it in water or aloe vera juice and waiting for it to liquify then adding oils for moisturizing effect and putting it in a bottle and using it that way. i don’t know a whole lot about soap making, but that seems like mold and bacteria waiting to happen. i know african black soap has unprocessed lye in it, so would that react to the koh and cause something disastrous to happen? lol. sorry to bug you with silly questions.. i have no idea how to research this. Hi i know this is an old post but i really hope you can help me. I really tried my best to make liquid soap today with no luck. I did the glycerin method using a crockpot and used oils and butters my skin loves, the idea was to make a body wash. But my mixture never got past the thick pudding stage. I was mixing for an hr then let it sit for 1.5 hrs only to come back and find that it had separated. The bottom was a dark amber color and the top was a dark butterscotch color. So i used my stick blender to mix it back up and proceeded to mix for another hr it turned a lighter shade of butterscotch but never got past the thick pudding phase. Even now almost 5 hours after starting i havent gotten anywhere. It still tests cloudy and i still get zapped. Its like runny pudding now and it looks like carmel cooking. I followed my recipe to the T with measurements and everything. I used brambleberry’s lye calculator. I just have no idea what i could have done wrong. Hi Tiffany! I’m afraid I have never made liquid soap using the glycerin method, so I don’t think I can be of any help :/ Have you tried asking over at Soap Queen? No i didnt even think about that! Thank you! You are awesome for getting back to me so quickly! I love your blog! Its so inspirational! Thank you for the recipe and the insight! Because it’s a living, and I need to research so much, I feel compelled to share what I’ve learned about glycerin since everyone seems to be mentioning it so much. Here’s what I know if anyone is interested, or it helps. Glycerin used to be created as a by-product of soap, which even this method is not really pure, but today can be done even cheaper. The industry uses a by-product of bio-fuel (usually always from palm or soy sources, both cheap and ecologically destructive). So it’s a bio-fuel by-product, not typically raw or organic glycerin. Most everything now flooding the food and cosmetics market is of very poor, low-quality. It is also very bad for health, containing both hexane and methane, which is one of the worst things for liver patients. It has the ability to shut down liver, instead of supporting it, which is what true organic raw glycerin would do. If a company is truly selling organic glycerin, they would be begging customers to also buy their by-product. If they aren’t, something is wrong because when you produce uncontaminated raw glycerin, you get 120 kg of fatty acid per only 20 kg of glycerin. This is a huge 6:1 ratio and it’s not cost effective without a buyer for the fatty acid. Another note is you can’t make glycerin over 98% organic. So if someone says 100% just know you have to use methane to go from 98 or above. Methane and hexane contamination means it will quickly reach your liver. I’ve unfortunately learned that everybody cheats in the glycerin market and the NOP doesn’t make surprise audits. Most of it comes out of India and it’s really hard to track clear supply chains. The glycerin bought now days costs next to nothing to make, is pure profit to off-set the cost of bio-diesel, and it’s harmful. Because I’m so passionately against palm oil, I have researched this to tears, and so far, I’ve only found one company in the USA producing their own organic glycerin. But they don’t regularly have it because they are often trying to find buyers for the fatty acids which the production also yields. I’m waiting till they make more. But at this point I just avoid glycerin like the plague in foods and all products. There are other alternatives out there, so I’d encourage everyone to not use glycerin or at least just make sure it’s a glycerin you feel comfortable using after research. Happy soaping! Hi Marie! Thanks for the reply and also thanks for the recipe! I know people love glycerin, but your recipe obviously works without it, and there are other options for the properties. Glycerin can actually be dangerous, especially for those with kidney issues. And depending on the climate you live in, glycerin can draw moisture away from the skin, so you could experience the opposite of what you want. And it’s all typically from palm oil plantations out of Southeast Asia. These ideas may help as alternatives. I haven’t tried these in liquid soap yet, but in soap bars, and also liquid cleanser made of Organic Soap Berries (also great for laundry), they work well, so possibly in liquid soap. Organic Slippery Elm Bark Powder from Oregon’s Wild Harvest adds emollient, soothing, and thickening properties (and in shampoo bars/products, it improves slip and wet combing). There is a “Bamboo BioFerment” liquid extract at Formulator Sample Shop that adds nice slip and moisture, which may work really well. Honey is a great alternative too as you mentioned, and also one I’ve really come to like is Maple Syrup which has great antimicrobial, soothing, and humectant properties. I get mine from Maple Valley Cooperative in WI. I think they are just very ethical and don’t destroy the trees for sap. I’ve really come to like it in my lotions. The last thing that comes to mind is in the oils adding Organic Jojoba. I get mine from The Jojoba Company. Obviously it’s not a glycerin alternative, but using this adds so much moisture, as it’s not actually an oil, but a seed extract and very much like your skin’s own natural protection. I’m always open to other ideas, so if you have any please let me know! You asked if palm is everywhere, and sadly it is :-/. The Rainforest Action Network reported, “In less than two decades palm oil production has quintupled, making it the most widely traded and used edible vegetable oil; it is now found in one of every two products sold in Western grocery stores.” For me, the rule of thumb is anything stating “vegetable” before any oils or glycerin is out, as it’s palm. Even fatty acids like Cetearyl Alcohol and Stearic Acid are made from it. I love recipes like yours because even things like Cocomidapropyl Betaine, a popular foaming surfactant is usually from palm. I only know one manufacturer making it with only coconut. And last week I got verification of palm in this ingredient from a leading manufacturer, whose representative flat out told me, “We always use coconut and palm oil interchangeably, usually more palm. It’s just cheaper.” So typically if it’s derived from coconut, you probably have palm too. So I stick to more whole ingredients. Try to stay away from anything with “coco” or “palm” or “glycerol” on the label intertwined in a bigger word. I put together a fun list of activities and information and major ways to make an impact with very little changes, if you’re interested, however I don’t want to rudely post a link on your blog, so just let me know if you’d like me to email you :-). Again, thanks for the cool blog and great recipes. I love all the tips and ideas! I know this is a really old comment but I was really interested in what you have to say about glycerine. I have the same palm hatred and try to avoid it at all costs. The glycerine that I get is from sustainable rapeseed- bought in the UK from intralabs. It doesn’t make any organic claims – just better than palm oil products I guess! Hope this might be helpful to someone. I want to make liquid soap but I have no crockpot and I can’t find one anywhere in the stores. I see you use electric stove, how to you turn down the temp to 2/10? I haven’t see an electric stove with that dial only high and low. My stove has a dial that goes from 1–10, so that’s how I do it. I’d recommend going to low, and then going approximately 20% higher? Keep it on the low side, for sure. Made it yesterday, already using it today. I can´t stop looking at it and feeling super proud, as when I started with the cold soap making. Thanks for the recipe, thanks for your super inspiring blog!!! Awesome! I’m so glad 🙂 Thank you so much for reading & DIYing with me, and enjoy that sudsy soap! Love your blog! I’ve been reading it for the past 6 months, haven’t yet made a product yet, but getting there 🙂 and hoping i can try out some holiday DIY gifts. I wanted to try this shampoo as my first project and a bit overwhelmed with the liquid soap making. I found a couple castila liquid soap options and was wondering which will work as good base for both a body wash and shampoo. Can you please recommend. Hi Kelly! I’d probably go with the plain base—it’s much better value and doesn’t already have essential oils added 🙂 Keep in mind that I have no experience with using either product as a substitute for homemade soap, though. Water as a % of oil is 38%. In your calculation on the picture you posted I see all the numbers are similar to mine except for KOH, you have 98gms. Am i missing something, want to get the base recipe right. Hey Kelly! You did everything right, you just checked that “90% pure KOH” box, which I should have done as well 🙂 Mine was just extra superfatted haha. I finally got some potassium hydroxide and made this recipe! The first time, I hadn’t realised that the temperature was such a strong factor, and added the lye to the oils when the oils were way too hot (I had turned down the stovetop but hadn’t given the oils any time to cool down slightly)… the whole thing foamed over almost straight away, all over myself and my stovetop, and the floor. It was quite spectacular. But I got straight back on the horse and tried again. The next time, I had much more success. It still foamed a bit, but not as much – and I used a much larger pot, so overflow wasn’t an issue. Neither time did my mixture go through a curdly sort of stage. It just went from a foamy liquid pretty much straight to big hard clumps. 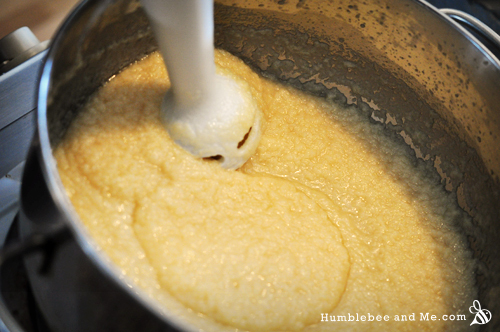 I then hand stirred the mixture for about 30-45 minutes. It never went translucent, but the texture did change at the end to be much more malleable, almost like Play Doh. I did the zap test and it didn’t zap me, just tasted like soap (ick!). So I feel like it’s fine to use. Gave my arm a bloody good work out, too. This does sound like over dilution 🙂 I find this paste does better on the thicker side of liquid soap, likely because it has far more unsaponified fat in it than traditional liquid soap does. Just made a big batch! Thank you so much for making it possible for me to have liquid soap on hand. 🙂 I am stoked! I made my 1st batch of liquid soap today! I can’t tell you how excited and proud I am! I ended up with a soap volcano after trace. Lowest setting on my electric stove top was too high. I removed the pot from the heat, waited for it to finish then used a spatula to put the overflow back into the pot. By them it was already taffy, thick mashed potato like and quickly went to translucency. I wasn’t watching the time but guessing I cooked it 30 minutes more, no zap. Tried washing my hands with it, no burning or redness. I use my left over bar soap bits as hand soap by melting them in boiling water. Is it OK to dilute the paste this way as well? Thanks for the awesome recipe! It really took the fear out of the process. I’m really excited about having liquid soap for the shower! I love your site and wish I had all the time and ingredients necessary to make so many of your creations! But regarding this post, I have a question regarding the percentages of each ingredient. Perhaps I am not understanding (I am a novice, as wet behind the ears as you can get when it comes to soap making!) but simply looking at the grams of each ingredient in the image shown, it looks like the amount of Olive Oil is 45% and Shea is 20% (rather than the listed 50% and 15%). Is there a reason for the difference? Hi Lauren! Honestly, I posted this recipe almost 2 years ago and made it well before I posted it. I flat out do not remember why the numbers in the photo might be different from the published recipe. Perhaps I made several versions and published one and photographed another? My memory is just not that good 😛 I’d go with the published recipe, not the photograph. Hi, this is Luca from Hungary. I am cooking this soap and I just realized that I completely messed it up. I used the SoapCalc recommended and for 600 gramms of oils it indicated 2.252 grams of water. So I did that but then I realized that my mixture is way too milky. I checked with another calculator tool and it recommended 396 grams of water! How can I save my soap? I really enjoy the emails and recipes you share with us. I have made a few of your recipes and they are all wonderful. I have a question for you (if this has already been addressed, I apologize. This post has too many threads to read them all). Majestic Mountain posted a new calculator to make liquid soap using both Sodium Hydroxide and Potassium Hydroxide (25:75) to make the soap thicker. Have you tried this at all? Apparently many liquid soap makers are now doing this although I haven’t been able to find any recipes with this formula. Would you add both the hydroxides at the same time to the water? I am waiting for the KOH to arrive from Saffire. One quick q: I am concerned about the final mass of the product. Although I’ve done the zap test, and the end product looks and feels like it should I’m a bit weary that there still may be KOH. How many grams of paste do you end up with if you use 500g oils? I was just wondering how much paste this recipe makes and how many 250ml bottles would I be able to fill once I have diluted it? Also how much paste to water would I need for a 250ml bottle? HI I would like to create a liquid bubble bath (that actually bubbles!) Would I use this recipe as a base? No—if you want the kind of bubbles we associate with bubble baths, you’ll have to use a surfactant, which I’ve never worked with. Soap simply isn’t enough. Just made the recipe yesterday and seemed like it worked perfectly, but it just took about 1.5 hours to get to Vaseline stage and looked a bit softer than yours (softer peaks). So, I divided the batch up and added water to one to make the liquid soap, first in the 1:0.6, ratio last night, then 1:1 this morning, now more for about 1:1.4. Didn’t think anything of it, just that it seemed strange that the paste wasn’t totally softening. I just noticed that although I used KOH, I actually calculated for NaOH, so the lye is off by about 40% or so (too little KOH). Should I just leave it as is or rebatch the entire recipe and add more lye? I don’t care how it looks, just looking for the softness. I know that too much lye could be an issue for soap, but is too little a problem? So after adding quite a bit of water to soften and still not liquid enough to mix with additional KOH, I decided to toss the entire batch and start over today. I was just afraid that the entire batch would go bad quickly. Thanks for your help! It’s always a bummer when that happens 🙁 But hey—learning experience, right? Though I would recommend testing the paste for clarity (helps catch any calculation errors resulting in lye heavy soap). I actually test the ph of the soap before use. Frankly, I have never had a lye heavy batch (maybe because I am paranoid about measuring), but there can always be a first time, and I’d prefer to find it out on a tester rather than on my skin. A Ph tester also comes in handy if you want to add stuff to lower the Ph (for example, for shampoo – a “normal” soap ph shampoo is not such a good idea for hair). I’d say it is a good investment that lasts long and completely worth it, if you are into DIY for stuff to put on skin. I’ve finally given your liquid soap a try and I’m impressed. Its works great! Thank you so much!! I’ve made shampoo with it too :). I’ve noticed that the hair tangles a little more than with a store bought shampoo though I use a hair rinse, do you know why that happens? The other thing I noticed is that by soap and shampoo separate, when I pour it into my see through pump I can see a translucent layer at the bottom and a opaque layer at the top, do you know why this happens and is there a way to fix it? I have a picture but can’t add it to the comment. Hey Kelly! Congrats on the liquid soap 🙂 Are you certain your acidic rinse is acidic enough? I’ve never had a problem with a not-acidic-enough rinse, but that could be it. You can read more here. Hi 🙂 First, I love your blog. I tried making liquid soap yesterday. I would say the end result is very nice. It is smooth and it lathers up nicely. However, it tends to separate if left alone. Not dramatically, but you can definitely see it separating. A gentle stir makes it smooth again. My question was : is this due to my higher superfatting percentage? I aimed for a 7 % superfat since I have a very dry scalp. Also, a lot of liquid soap making tutorials promote a 0 % superfat when making liquid soap in order to achieve a crystal clear liquid. How is this not drying? Thank you so much! Hey! Yes, this is because of the higher superfat; that’s why you’ll find so many recipes that call for 0% as you mentioned. Handmade soap still isn’t as strong as detergent, even with a 0% superfat, but I imagine it would be more drying than a soap made with a superfat. Marie, maybe you can help me. I tried this recipe, but had a glitch. When I went to add my KOH/H2O solution to my oils, the pot bubbled over instantly and made an enormous mess. It was a stainless steel pan, and everything was on just warm heat. I can’t figure out what went wrong and I can’t find a trouble shooting guide for this. Any ideas? Hmm. Was your pot definitely large enough? It does sound like everything might’ve been too hot; were you on the absolute lowest heat setting possible? Actually, I was on low heat and not warm. This was both my first attempt on my stove and with KOH, and several tutorials I read said “heat doesn’t matter”. It seemed odd to me (I was a chemistry major before I switched to anthropology) AND in retrospect, I think they meant “the temperature of the solution and oil don’t have to match” but heat DOES Matter! Lesson learned. Thanks! Hmm, I think you’re right. At least the problem’s been solved, and I bet your stove is SUPER clean now haha. Nope—the high pH and general nature of soap prevents bacteria from setting up shop and spoiling it 🙂 I’ve written an FAQ on the matter. So, I am going to take the plunge and make this… my first foray!! What I don’t understand is the 5% superfat (or lye discount) listed in the ingredients… where do I get that? I am going to make a 500g batch… but I don’t understand why the percentages add up to 105? I’ve just stumbled upon your liquid soap recipe, and I’m so relieved! The liquid soap-making book I bought goes on and on and ON about the mashing and neutralizing and acid…and above all, making sure the soap is perfectly CLEAR. Personally, I don’t care if the soap is clear, as my liquid soap dispensers are opaque. Thus, the soap will never be seen (except for the brief second that the dispensed amount sits in my palm before I start washing). So, can you confirm that clarity (or lack thereof) is nothing but personal preference and does not affect the soap’s quality in any way? If so, you’ve made my day! And my apologies if you already answered this in the lengthy string of comments above; I read some of them but had to cut to the chase here 🙂 Thanks! Hey Alison! Welcome 🙂 I have found this liquid soap to be perfectly lovely as I couldn’t be fussed about the transparency of it. Just be sure to check that “90% KOH” for accurate calculations and perhaps drop your superfat—some readers have reported issues with separation, so a superfat around 2% should help that. Happy soaping! Will you ever make a video of this one? Maybe, but dannng, soap making videos are LONG. They take ages to film, so I need a pretty long runway (of posts and other things already done) to get one done, and I don’t have that right now. I want to make liquid milk soap. Is it similar to hot process? could I produce it by cold process? Please guide me. This is going to sound really lazy – but it’s not! I would love to do liquid soap paste but have not ever been involved in super fats and such. I was going to take my melt and pour already made Shea bar soap and mash it up and add water before I saw this. This sounds much more natural as these melt and pours have a lot of chemicals in them. Can you give me the exact amounts of everything for the batch size you made and I could just duplicate it. 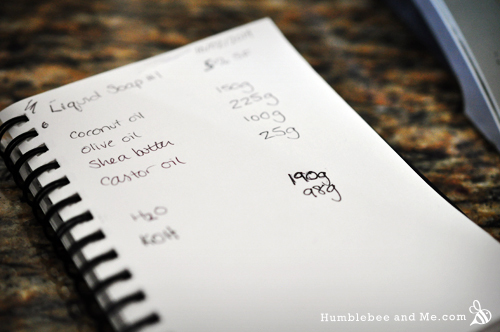 I don’t want to delve into real soap making but this recipe looks great. Could you give the “calculation” because I’m way to babyified in this natural world I recently entered to figure it out, but I know if I had exact measurements I could do it! 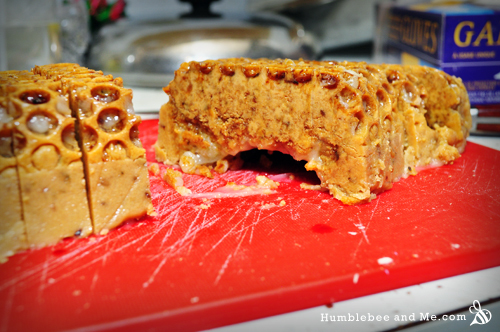 I have just found humblebeeandme and am looking forward to traveling through all of your posts and recipes. If you’re brand new to soap making, be sure you read up on soap making safety, too! Hi Maria, do you know the ph of this soap? What about the PH of the liquid shampoos you made using this soap base? I am just curious as I was told the best shampoos should have a PH of about 4 to 5 so that it is mild for everyone? Thank you. I’m afraid I don’t—it’s definitely basic, but just how basic is hard to say. Probably between 8–10. True soap is always basic because lye is very basic; anything with a pH as low as 4 or 5 is much more likely to be made from surfactants. Hi Marie, I too wanted to share my experience making your liquid soap. The process went incredibly fast and in retrospect I must have had a soap volcano too. 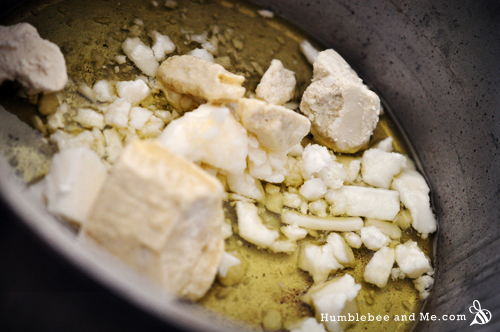 When I added the lye to the oils, I could see the emulsification right away – it turned milky white as I poured it in and immediately looked like regular cold process soap batter once I started stick blending. It never looked curdled. I kept it on the lowest heat possible but then it started slowly bubbling up like when you make caramel sauce. I didn’t really think anything of it until it started bubbling up to the top of my pan. I managed to transfer it to the sink in time for only a bit to run over the sides. 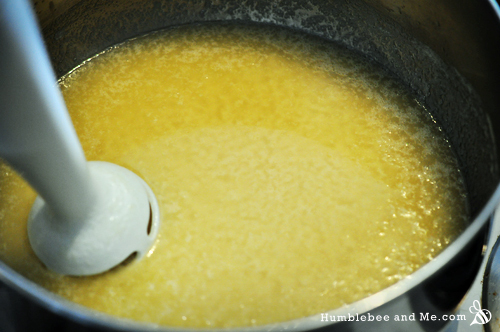 I kept stirring and it thickened up very quickly, going immediately to the Vaseline stage. I never put it back on the stove but it looked “done” compared to your photos (very helpful to have the pics by the way.) 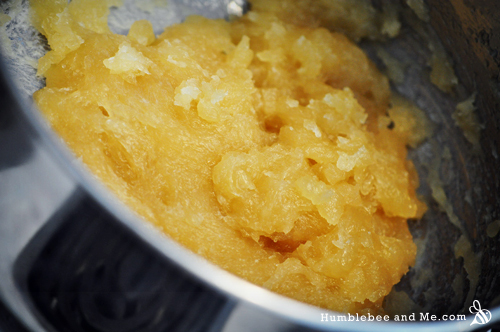 I am making some cleansing balm now and can’t wait to start experimenting with the paste! Thanks for the recipes, your time, effort, and giving spirit! Thanks for sharing, Christine! I hope you are enjoying all the things you’re making from your soap paste 🙂 Thanks for DIYing with me! Hello! I want to make this as a gift for my nieces and nephew who refuse to use bar soap (teenagers, ugh). Does this recipe have a good lather? do you think it suitable for both hand soap and body wash? I sure hope you still check this thread 😉 Thanks! Hi Marie, thank you for this great post! Easy to follow and great pics. I have access to very good quality castor oil. What is the largest percentage of castor oil you would use in a liquid soap? Do you know what would happen if you make a 100% castor oil soap? I appreciate your help and all the knowledge you share in your site. Thank you! Hey Alejandro! I would recommend running it through SoapCalc and watch the numbers for lather/softness/moisturizing/etc., and see what you think 🙂 I have not tried high castor oil percentage liquid soaps, so I can’t offer much advice here. i am making the liquid soap now and its a bit of a disaster. I added the lye water and blended for maybe 10 minutes with stove top on 2. the batter began bubbling then very quickly started to bubble over the top of the pot (even though I had removed it from the heat). Luckily i was able to get it into the sink for most of the volcano. Interestingly it turned vaseline like/transluscent quickly after this as i stirred. if i left it for any period of time without stirring, it would bubble up again. What on earth happened here? Also, i have put it back onto the stovetop now on low and i’m cooking it longer because the zap test zapped me (i think, lol). it burned my tongue. Hey Lyne! I’m sorry to hear about your soap disaster 🙁 It sounds like it got too hot. It’s hard to give advice on what stove number people should use since stoves vary so greatly, as do pots. Were you using a heavy bottomed pot? If it was thin, that might be part of the problem. Can you try it with a thicker pot and/or a lower stove temperature? i want to use this for laundry soap- do you still super fat at 5%? Hi Marie, Thank you very much for sharing your knowledge. Yesterday I did my first soap ever and it was your recipe -How to Make Basic Liquid Soap (The Easy Way)- exactly unless the superfat, I made it 15%. It went fine -praise be to Allaah-. But during adding the lye to the oils, it volcanoed on me, and some of the oils overflowed out of the pot, good for me that I add 15% superfat. I did the zap test and turned good, didn’t zap me. I divided it to 3 parts. 1 I diluted it. When I used it to wash my hand it made them very dry. I thought of adding some glycerine. But how much should I add? and do you have other suggestions to solve this problem? Hey! Congrats on your first soap 🙂 However… 15% superfat is WAY too high. Like, 2–3x too high. All that excess fat in your soap is going to go rancid, and you will have to throw the soap out, so I really hope you didn’t make very much. It also sounds like your heat was too high, which is what caused the volcano. All soap is going to be drying to some degree; it works by removing oils from your skin. That’s how all cleansers work, really—there is no way around that. Adding glycerin may help a bit, but remember that you are washing it off almost instantly, and the soap is still taking the oils on your skin down the drain. I would look at drinking more water and making a nice hand lotion to replenish that moisture rather than trying to load your soap up with humectants and jacking up the superfat to unsustainable levels—all of which will just get washed down the drain! Love your website, videos and book! Can you please make a liquid soap making videos? I love your videos…learn lots of techniques and tools/gadgets from them! Cheers! Is there any advantage to doing this process rather than just grating up some bar soap and dissolving it in water? Thanks for all your recipes, by the way 🙂 I’ve been making soaps, body oils and balms for years, but have been inspired by your blog to take to plunge and order some emulsifiers and preservatives online, so I can dive into the world of lotions! Can’t wait til they arrive! Yes, definitely—making soap with KOH vs NaOH produces a very different end result, the KOH being much more liquid soap friendly as it produces a soft soap. Read this for more info. I find true liquid soap to be a much nicer final product—super wet bar soap is pretty slimy and gross in comparison. Happy making! Do you think it is possible to overcook the paste? I cooked mine and it was getting transparent, but I thought I was still getting a zap so I let it cook a little longer. Then, it started to get thinner and less transparent. I had already cooked it for about 45 min, so I pulled it off and am trying a test dilution right now. Have you heard of this? Hmm. Well, I’m sure anything is possible, though I haven’t heard of that or experienced it. How did it end up turning out? It turned out OK – not great. 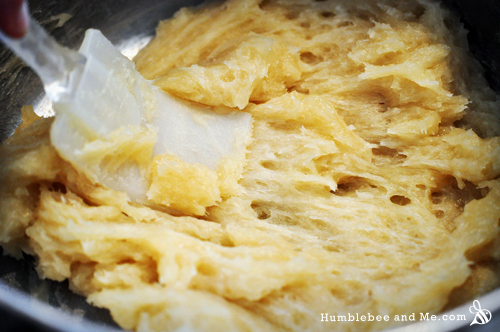 The paste takes days to dissolve rather than overnight. The end soap product seems to work well. I guess I will stop earlier next time. So this might have been mentioned, I scanned through some comments and didn’t see it. Is it possible for this to be made with cow’s milk? I tend to prefer cow’s milk soap when possible, so I wasn’t sure if that was an option here. I haven’t tried it, but I honestly don’t see it going very well. You’d effectively be boiling milk for at least an hour, in combination with a high pH chemical. I’m pretty darn sure that’ll curdle something fierce. I was won if this would work for a foaming soap? Like in a foaming dispenser? I am new to making liquid soap base but wanted to make sure I could dilute it to where I could use it in a foaming dispenser before I get started. Thanks! I’m not sure—the only concoctions I’ve made for foamer bottles are surfactant powered (stay tuned—recipe coming later this month!). You definitely can dilute liquid soap to be totally water-like, but I’m unsure if that would actually lather at that point as it would be quite heavily diluted. But, again, I’ve never tried it! I might have to try it! I’ll have to get my ingredients and let you know. Looking forward to the next recipe 🙂 I make Foaming soap for a commercial building so I need it to work right. Sounds like a fun, sudsy job! I’m afraid not! I’m not a hugely experienced liquid soap maker (I seem to dabble in too many things, haha), so I just use whatever the lye calculator tells me to. I believe there are some comments somewhere in this thread about using glycerin, though, so perhaps try an in-page search? 1) The first batch I made I didn’t add enough water to it, but didn’t discover that until I had everything mixed up and in the bottle – it was too thick to pump (I had done approximately 1:1 for softening). So I added some water (don’t know the exact amount), but then it ended up being too runny. Now, because I had already added the essential oils, I couldn’t just put it all in a container with some more soap paste and heat it up again in the microwave, so this is what I did instead: I took out some more soap paste (I forget how much exactly, somewhere between 20 and 40 grams), softened that most of the way separately, then mixed them together. Voila! Too runny transformed into perfect in just an hour or two. 2) I also decided to try something this time around. For some reason, my soap paste was taking longer to soften than it did the last time, so, after mashing it, heating it, mashing it some more, leaving overnight, mashing, heating, and mashing some more, I decided to try my hand at using my immersion blender. NOTE: I would not have done this at the beginning of the softening process – the soap is still too stiff at that stage (the same reason Marie recommends switching to a spatula when making the soap). I waited until it was fairly softened before I tried it, and once I did, it finished softening up really nicely. I did end up with a few little lumps of not-quite-softened soap paste, but I got rid of them by using a turkey baster (minus the needle) to put it into the bottles (my shampoo is too thick to use a funnel). Awesome tips and problem solving! I have used my immersion blender in similar situations (with surfactants as well), and as long as you can keep the blender fully submerged so you don’t whip in a ton of air it works well! Thank heavens, too, as I can be impatient haha. The turkey baster thing is also genius! It is worth noting that using this up in a month is not the reason you don’t have to worry about spoilage—you don’t have to worry about it because of the naturally high pH of the soap, which makes it self preserving. A month is more that enough time for something to spoil if it’s going to—heck, a week is way more time than it needs! This time around I also discovered that another way to thicken it up if it’s too runny is to leave it open to the air overnight, and the excess water will evaporate off – another solution to try if you’ve already added the essential oils. HI! Thank you for sharing this! I will try it soon! I just wondering if we need to put preservative in the liquid soap after the dilution? Hi! First time in makng the liquid soap. I use food base lye after 1hr cookng the paste form the smell is bad, tones of bubble so i put the fire out, it will melt fast when it heated again and its hard when it cold. i am makng right thing? I can tell just from looking at the amounts that whatever you’re making is dangerously lye heavy. Where did this recipe come from?! I ran it through SoapCalc and this amount of fats would only need 23g of KOH, meaning you are using almost 5x more lye than you should be! Please dispose of this highly caustic experiment safely and promptly. I made a video to teach people how to use SoapCalc so they can be sure their recipes are safe; you can watch it here. The recipe is came from here, some of ingredient is not available so i use what i have. The lye i use is a liquid form that i buy in supermarket so i dont know if i should add water or no water. I watch the tutorial of soapcalp and i was suprise to see the details, i dont see thos detail when i press calc. Pc is brok i gues. I’d recommend you refer to Soaping 101 to deepen your understanding. If you are using a liquid NaOH solution you MUST know the concentration otherwise you really cannot work with it. Okay so I made this several times. My most recent was a double batch in the end of October 2017. There are small beads of white that very much resemble beeswax pellets (no, I did not use beeswax ). It does not smell any different than it did when I made it. Any idea what that is? Maybe just an oil or fat separating? I’m suspecting it’s gone grainy—something that also happens with body butters, often when they contain shea butter. I’ve collected some links on the matter here, but I’m afraid I have no idea how one would tackle/avoid the issue in soap. The typical recommendation for body butters and the like is to bring it to “trace”, but obviously that already happens in soap! my liquid soap became a hard mashed potato… I cannot cook it further because the heat will burn the soap..
Can you provide a remedy? It sounds like you likely cooked it at too high of a temperature—you can try diluting it with water at this point and checking the pH, and if it’s not too high you’re probably ok, but it’s hard to say because you didn’t give any indication of how long it was cooked. Good luck! I need help troubleshooting, but first, I’d like to say that I truly appreciate all your time and effort that goes into these recipes, the newsletters, experiments & blog. It sure makes things easier for your readers!! First timer w/liquid soap (your recipe) & have only done a few batches of hot process & a few cold process soaps. Two days after diluting my soap paste, I noticed a layer of oil at the bottom of my container (separation?) would you have any idea, as to what I may have done wrong? Hey Darla! Thanks for reading and DIYing with me. I have a hypothesis; basically, soap is an emulsifier. Because this paste has a superfat, the soap is what holds emulsifies that excess fat. However, I suspect that if the soap is diluted past a certain point it looses its ability to emulsify that superfat in the water, so the superfat separates out and floats off to hang out with its friends. That’s just a hypothesis, but it makes sense to me! I love your room temp cold process soap, and have done it a few times. Have been wanting to try this liquid soap also, and finally got the KOH. But I’ve been having on my mind some sort of soap or wash to use at the office, for hand washing. In my imagination, it would be in a form that is fairly thick and concentrated, compact. But it would have to live in my drawer, so bar soap or liquid soap are less than ideal. Do you think the texture of this paste would work (as is, or a little diluted/softened) in a smallish jar to scoop or swipe a little for hand washing? I also have your book and some of the ingredients, so, hoping to try something from there some time in the future. Thank you for all your work, your recipes and information are such an inspiration! I’ve actually been working on something like this that’s surfactant based for a while 🙂 You’ll likely need to soften the paste a bit, but it will likely depend on the sort of container you use. You can, but it will make for a very messy end product. what is the grade of Koh? is it pharma grade or lab grade? I’m afraid I don’t know and haven’t found much on this—I would think either would be fine as both should be quite high/pure grades, just make sure you know the concentration of the KOH so you can calculate it properly. Hey Marie! I do make Liquid Soap currently for Shower Gels. If I do need to make a paste for a face wash (dry/ combination/ oil) skins, which oils do you reckon I use? Hi Marie, just excited to have come across your site, tons of information..do we add the lye water to the oils,with heat still on or can we do this without heat and then turn on heat after trace? the second is the usual hot process method i know about. I keep the heat on low throughout, but I’d be interested to hear how the second method works for you if you try it! I’m so thrilled! Thanks so much for sharing your experience and for DIYing with me! Can you convert your recipe into cups/tbsp/tsp/stones/pounds/etc. ?